June 22, 2013 • CATEGORIES: News • TAGS: 2013-May-June-Trip. We made it home after driving 10,043 miles through 27 states. Time to rest. I’ll summarize the trip tomorrow night. Thanks to everyone who helped make it so special! June 21, 2013 • CATEGORIES: Event • TAGS: 2013-May-June-Trip. As fate would have it, today we had an opportunity to have a brief meetup with Karson and his FEMACorp team as they headed east and we headed west on I-80. I made sure he got a copy of the new book, too. I know it looks like he is taller than me, but I’m pretty sure that’s an optical illusion. June 21, 2013 • CATEGORIES: Features • TAGS: 2013-May-June-Trip. Steve and I in front of this CJ-2A on a beautiful midwest afternoon. 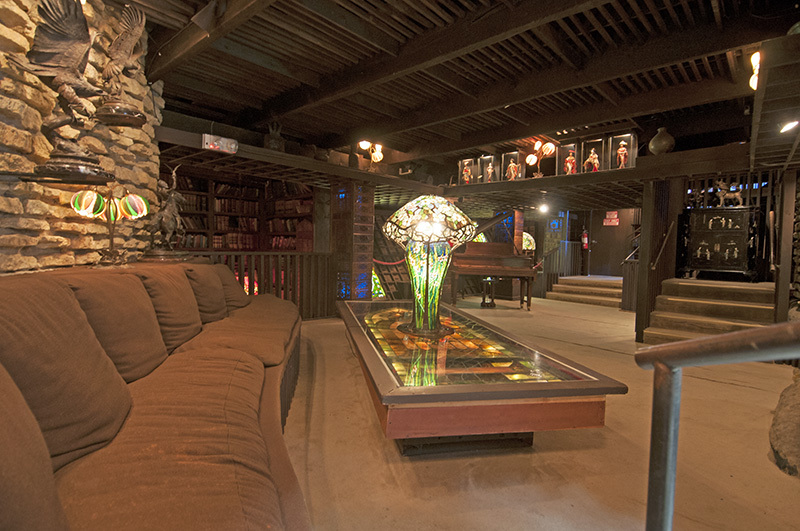 In 1993 I visited the House on the Rock near Dodgeville, Wisconsin, for the first time. Mom, my sister, and my ex-wife went with us. We’d heard it was a popular place to visit, but no one could really describe why. After our visit, I could see why people couldn’t explain it. All I knew is that some day I hoped to experience it again. On Wednesday (20 years after the first visit) I returned. I told Ann that you have to see the place to believe it. 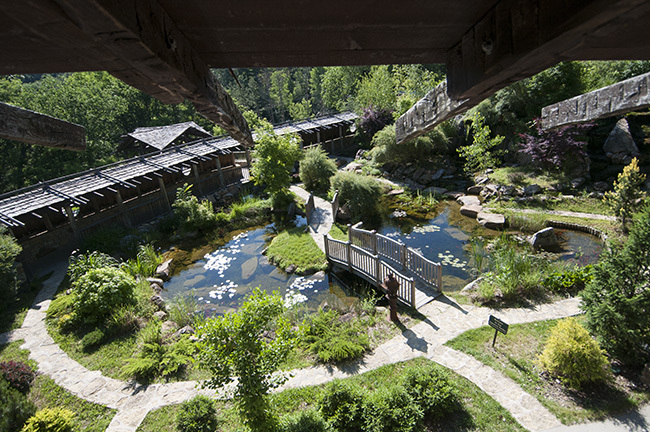 It starts with an unusual house built on a rock (actually part of it is cantilevered over the rock) and then becomes a series of collections and spaces ands spectacles. 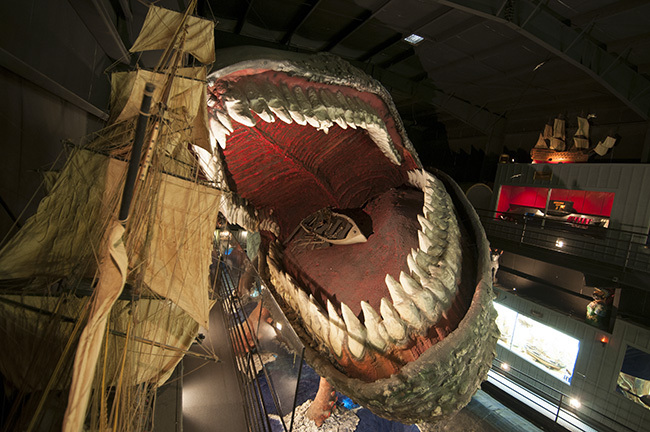 There will be music, a giant whale, and the world’s largest carousel. I won’t go into the history of how Alex Jordan created this amazing spectacle, but it seems a meeting with Frank Lloyd Wright and some subsequent spite played a huge role on why Jordan landed atop a rock. Just enjoy the pictures. The house is made up of two parts. A long walkway connects the two. All of it has a Japanese theme. 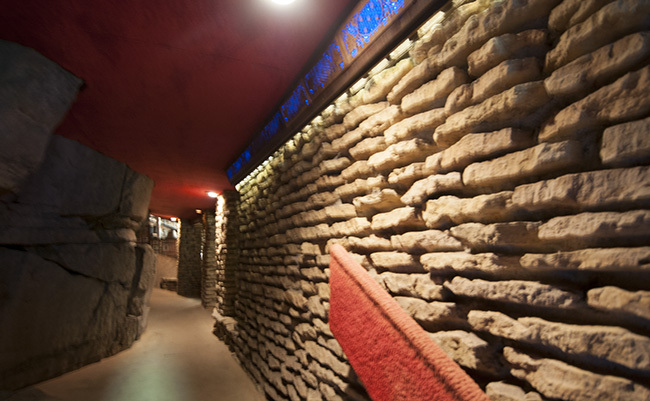 There’s lots of limestone, small spaces and neat angles. 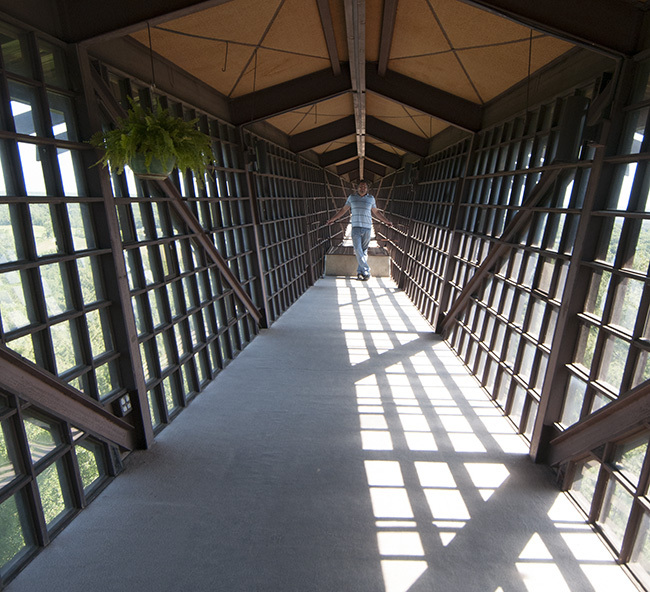 The infinity room is the most spectacular. After the house you enter the second part of the tour called Yesteryear. This area is quite dark, so it’s hard to get good non-flash photos. As you wind through different rooms and spaces, you can play put tokens into them and hear the music. 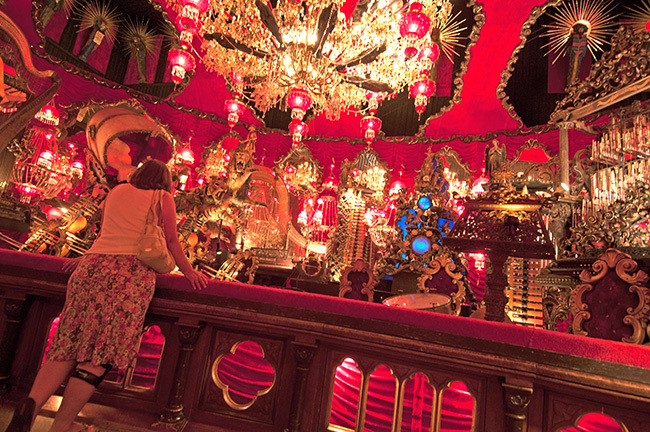 This Red Room is full of different instruments that play as an automatronic band. This is one whale of a room! 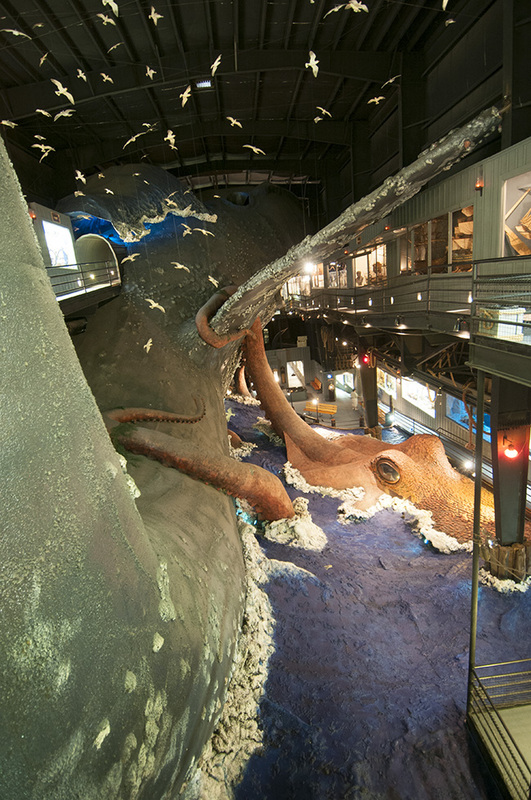 In this room a three story whale is getting attacked by a giant squid. Did I mention this whale is huge? 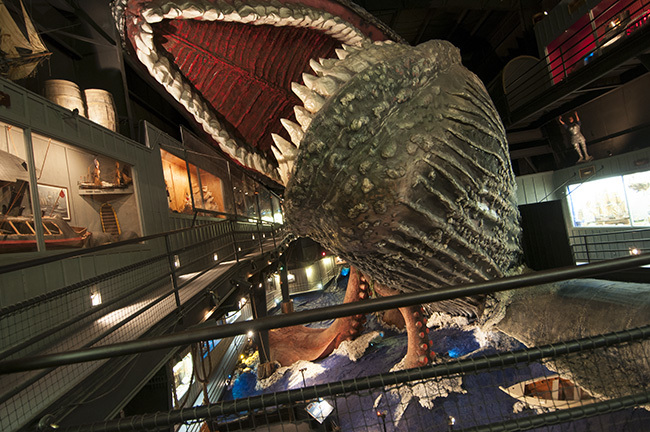 You can see inside the whale’s mouth in this photo. That boat is the size of a canoe. 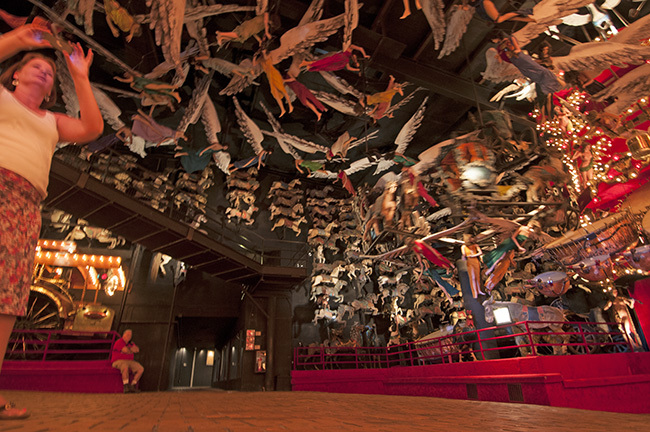 Carousel room with an endless collection of horses on the walls and ceilings. 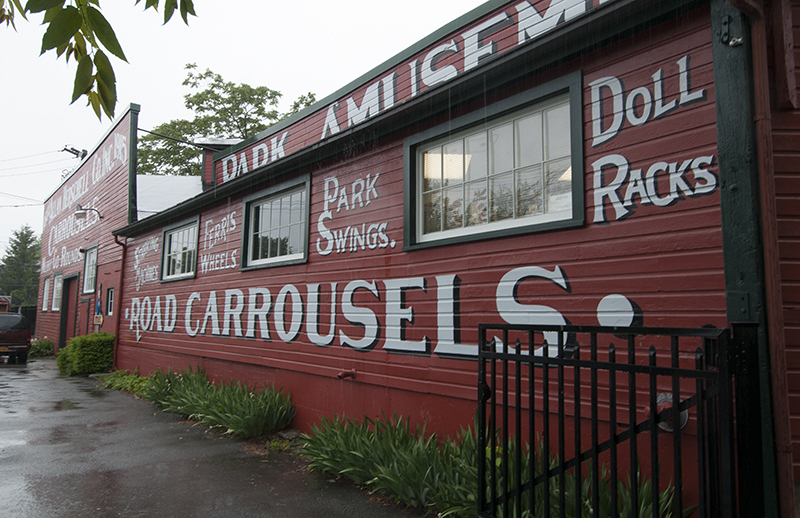 Photographing the carousel proved difficult because it spins continuously. 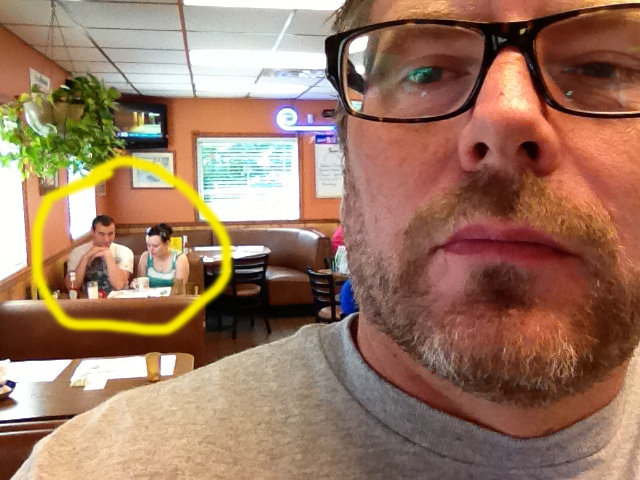 Note the man sitting in the background. that’s how large this room is. Those overhead walkways show just how big those steel drums(?) are. Another photo showing Ann underneath everything. 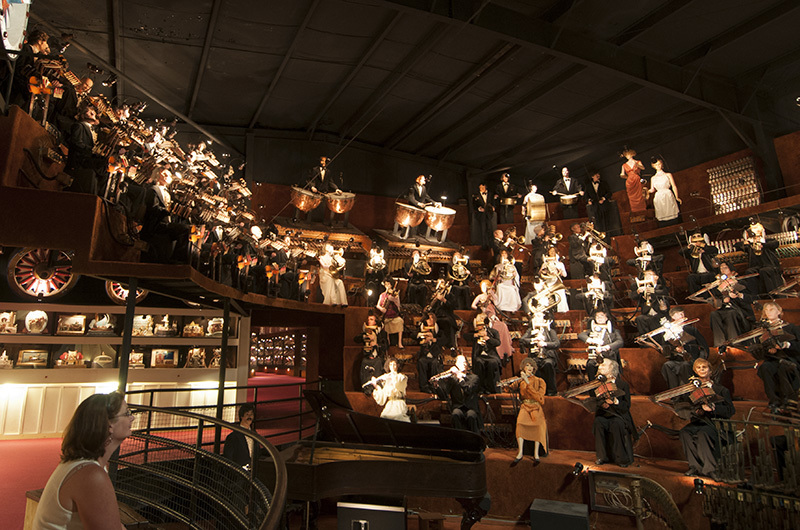 Another animatronic group that plays to tokens. 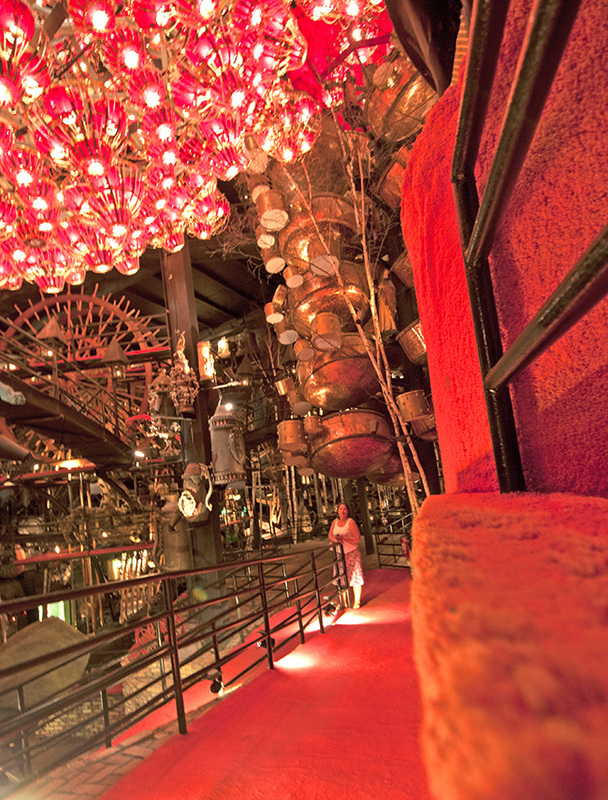 It took us three hours to complete our House On the Rock tour and we moved pretty quickly through it. We also didn’t read anything at the start of the tour. It’s an amazing experience and most everyone will enjoy it. After the House, Ann and I headed to Steve’s house in Ames, Iowa. 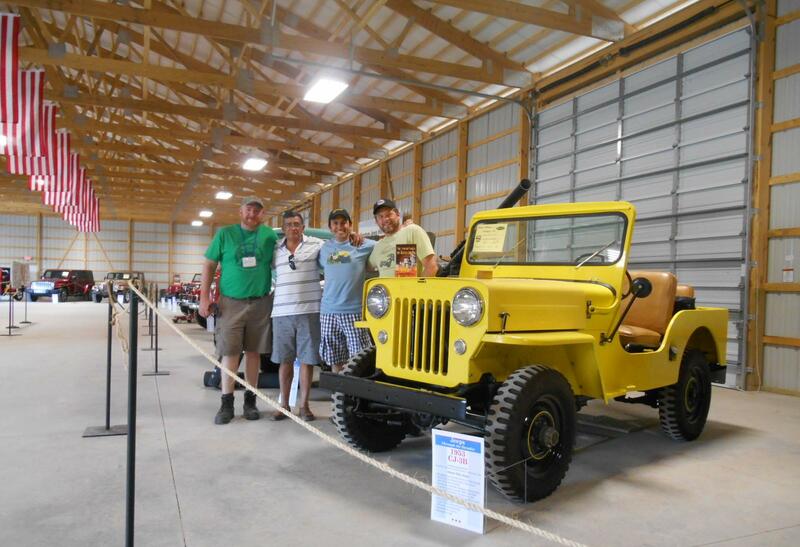 Steve has a runabout CJ-2A and several CJ & wagon projects. With a hope of reaching Kearny, NE, at a reasonable time, we didn’t stay too long, but it was great to finally meet him after exchanging a variety of emails! Thanks for working with your schedule Steve! June 20, 2013 • CATEGORIES: Features • TAGS: 2013-May-June-Trip. 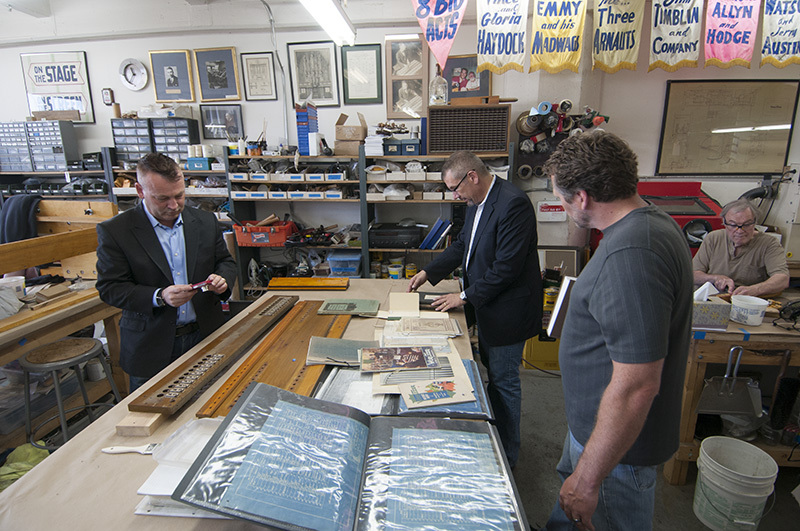 After a long night’s sleep, Tuesday we drove into Chicago to visit with Jeff Weiler, owner of JL Weiler, Inc. Jeff’s company specializes in the restoration and conservation of high pressure pipe organs. 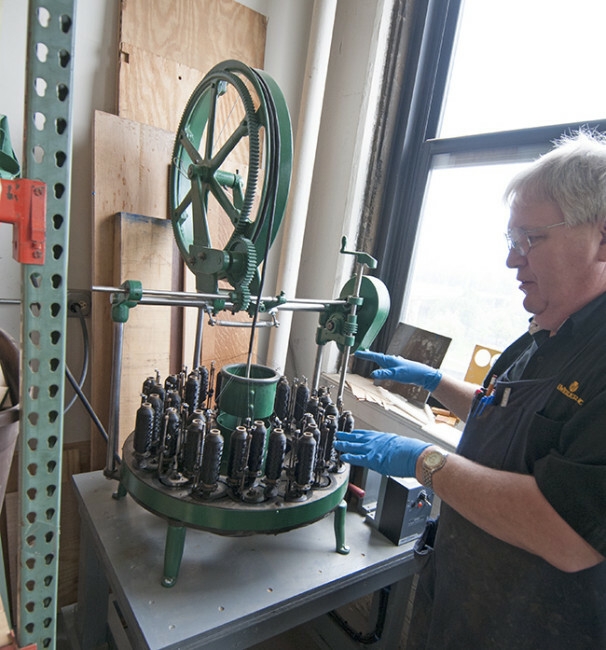 He wanted to show us his shop and the work he was doing on a Wurlitzer Organ from Sydney Australia and a second one that is being installed in downtown Chicago at St. John Cantius Church. 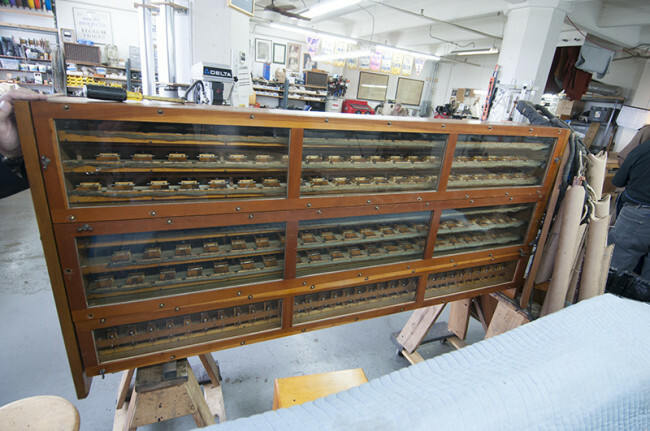 This series of binary relays represents the Wurlitzer Pipe Organ’s ‘computer’. It is complex and requires a great deal of wiring. Of course, on this trip we’ve learned a thing or two about wiring! Here is the third harness weaver we’ve seen during our journey! 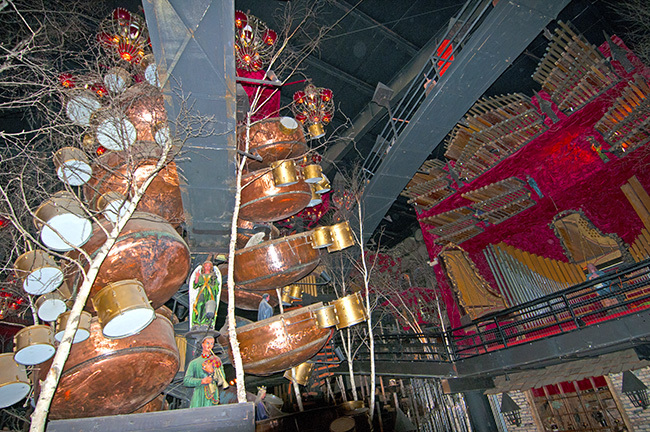 All the pipes and instruments have to be tuned. 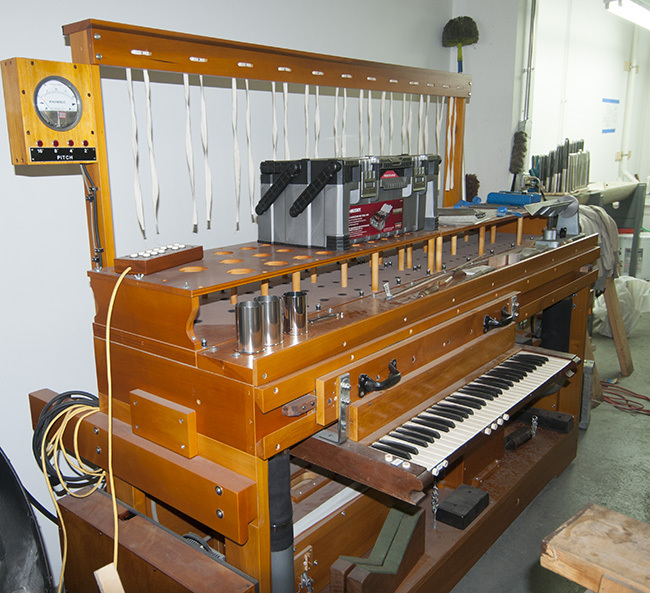 Here’s the contraption jeff uses to insure the completed organ sounds the way it should. To properly rebuild the organs, Jeff has saved many documents. Here is just some of the Wurlitzer documents he has to reference. Here Tom and Jeff show me some of the blueprints they own. On Monday June 17th, we decided to attempt three car museums in Indian within a single day. I’m happy to report that my wife was receptive to the idea and our adventure did not end in divorce! 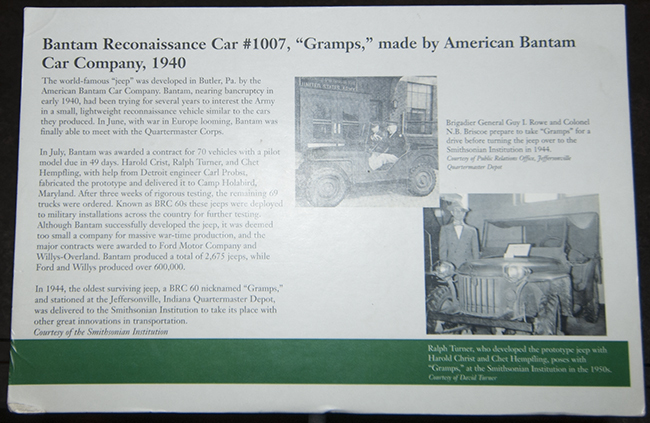 The first two museums (National Automobile and Truck Museum of the United States, also known as NATMUS, and the Auburn, Cord, Deusenberg Museum) were started by the same person. Given they are essentially on the same campus, at least it seemed that way to me, you might think the two would offer a joint ticket package or jointly advertise. Instead, they barely mention the other on their respective websites. In fact, we only discovered the NATMUS after arriving to see the ACD museum on Sunday evening (but we arrived too late to get in). 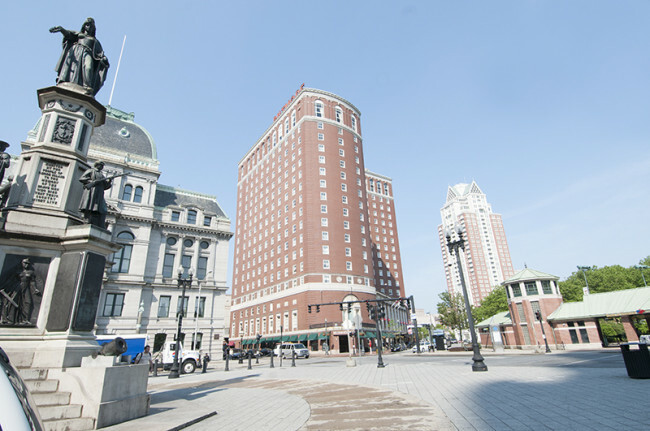 The NATMUS building is in the distance, while the ACD museum is to the right. Having mapped out our strategy, on Monday morning we began with the NATMUS, because it opens at 9am (the ACD doesn’t open until 10am). 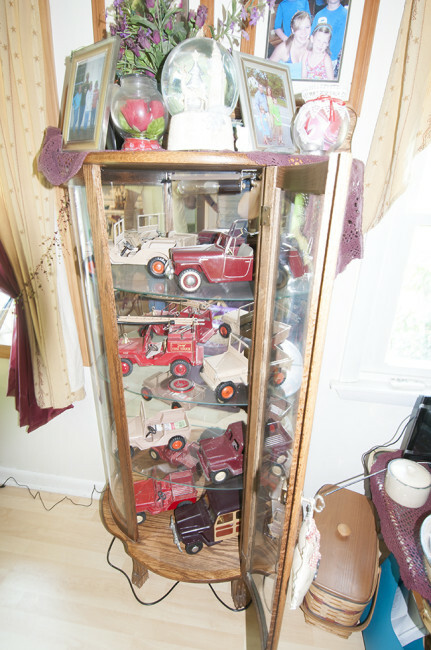 The collection can be roughly divided into three sections. Active Military get in free, which saved us some dollars. 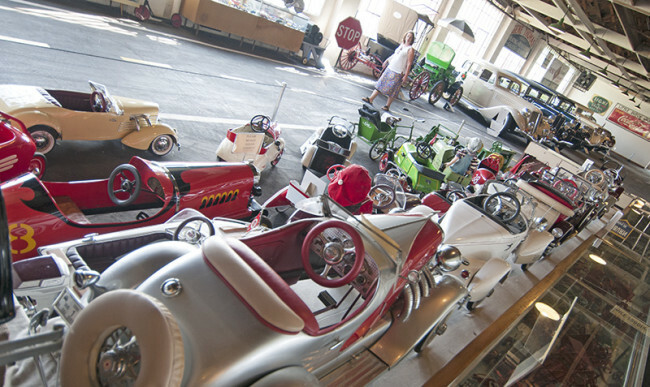 The first area is filled with toys of different sizes. 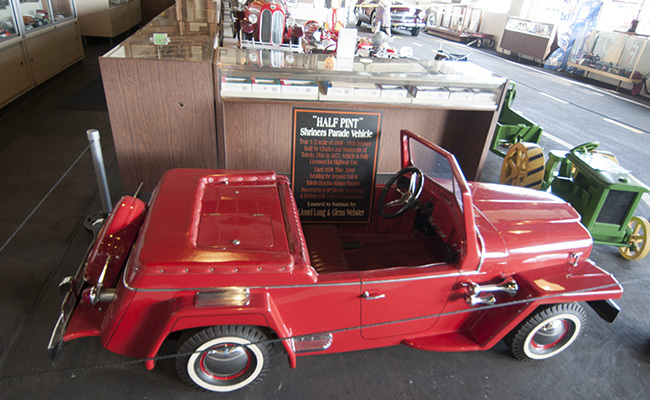 While they were neat, we’d certainly seen more at the Antique toy and Fire Truck Museum. 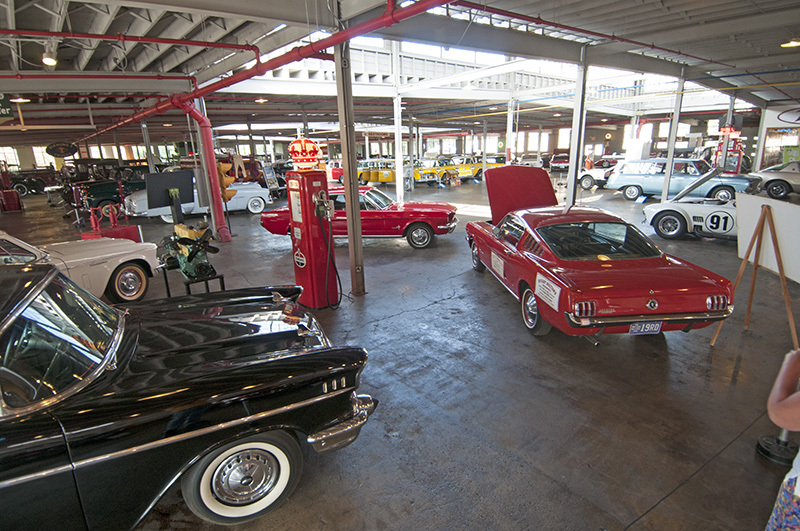 The second area is filled with a variety of cars and trucks of varying vintages. It’s a smorgasbord. 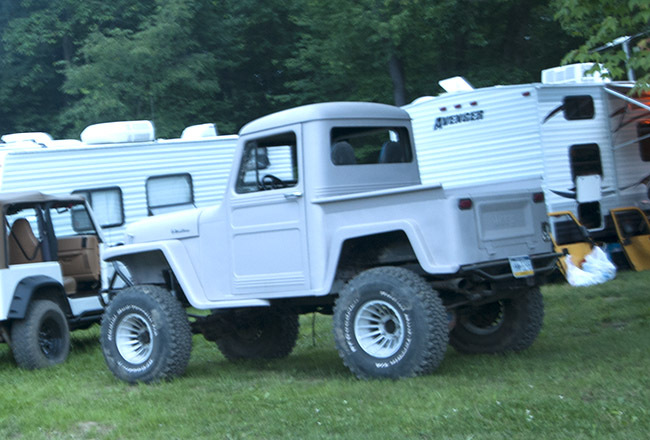 The only Jeep we saw was this half-sized jeepster. June 17, 2013 • CATEGORIES: Features • TAGS: 2013-May-June-Trip. 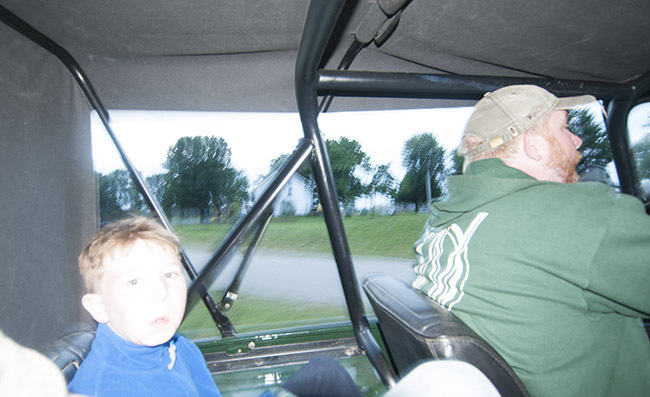 On Saturday evening (June 15th), we went for a ride in Gerald’s CJ-3B. He explained he’d spent lots of time camping at Cooper’s Lake, so he showed us how large the grounds were. We forded a couple streams and rounded the lake while comparing jeeping stories from ‘back in the day’ when we had no gray hair. Gerald’s driving and his son Will is in the back seat. I’m in the back seat, too. Not the best light for photography, especially with the jeep bouncing. We spotted this shortened truck while out for our drive. It was 9pm when we arrived back at our humble camp. Here’s a shot of camp (which I forgot to post last night). We had lots of space and privacy. Note the eWillys sign hanging from the canopy. We had a lake view and electricity. If we’d only had a fire pit, it would have been a perfect spot. Not long after we returned, Ann got on her phone and learned that storms were heading our direction. Normally, we wouldn’t mind listening to the rain bounce off the canopy roof above our tent. However, since we still had a week before we’d return home the last thing we wanted was to pack a went canopy and tent in the morning. So, we decided to pack up and head out for Niles, OH. 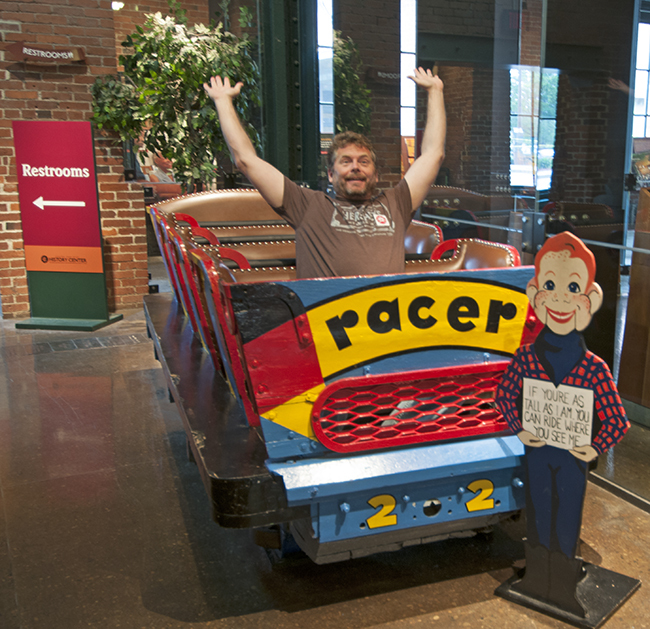 We chose Niles, because it was close to our next museum visit: The Packard Museum. June 17, 2013 • CATEGORIES: CJ-3B • TAGS: 2013-May-June-Trip. Sebastian took some additional photos at the Bantam Festival. Here’s a great shot of Gerald, Augusto, Sebastian, and myself. That’s Sebastian’s CJ-3B to the right. June 16, 2013 • CATEGORIES: Features • TAGS: 2013-May-June-Trip. Not everyone was happy to see me. Henry claimed I made a comment that it was too bad someone painted his surrey brown. I couldn’t find any evidence that I said that though. His modified surrey is beautiful!! The windshield is one of the nicest I’ve ever seen. The backside was filled in and the front has been scalloped perfectly. To our relief (and everyone else’s) the weather for the Bantam Festival turned out to be beautiful! Friday the crowds were light and only seven people came to my presentation. On Saturday we the weather got hotter and the crowds ballooned. By 10:30am, when we briefly left camp to get a few drinks at the local gas stop, we were shocked to see a lineup of over 2 miles of jeeps! June 14, 2013 • CATEGORIES: Builds, Features • TAGS: 2013-May-June-Trip. Look Roy. You made it to the top! Today at the Bantam Festival I had a chance to meet Roy, who’s a daily reader of eWillys. 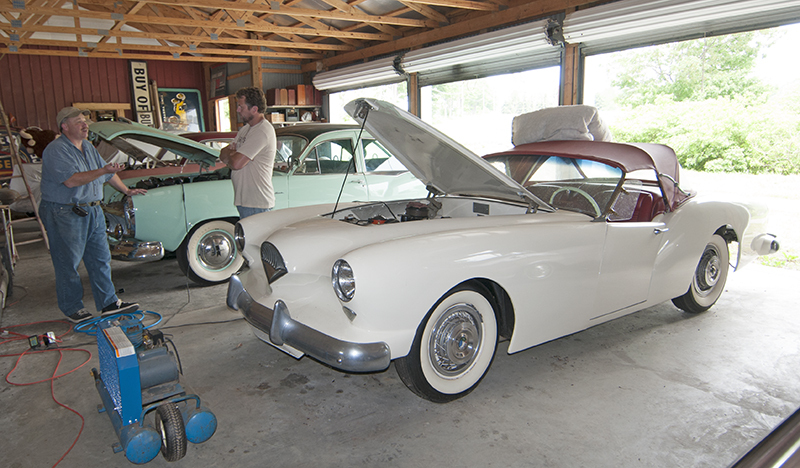 He found this 1952 M-38 on eWillys and has spent the past year fixing various issues. He assures me it purrs. It sure does look great! 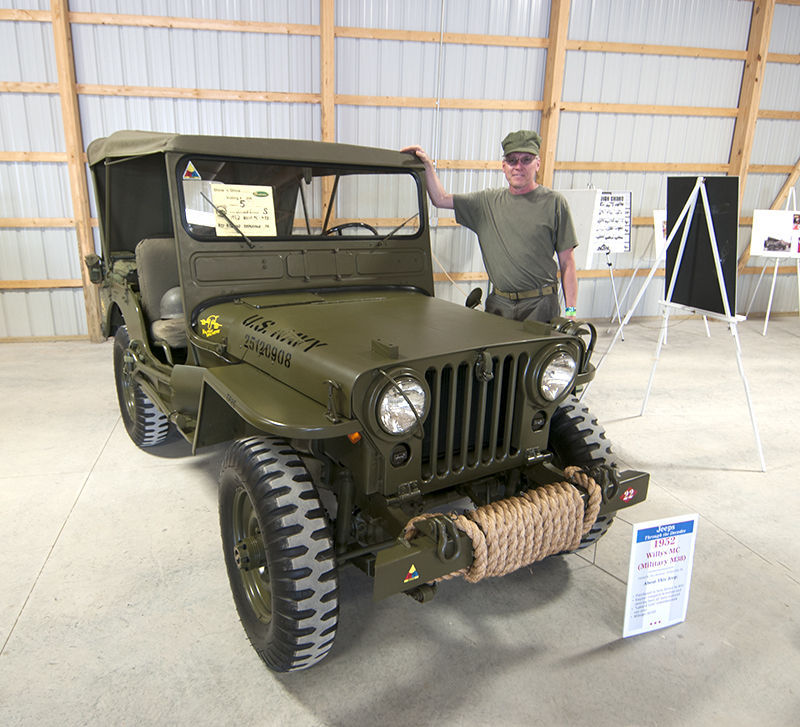 He explained it’s a former Seabee jeep. He said the man he bought it from told him that the green is the proper color for this jeep. If you get a chance to talk to Roy, he can explain the reasoning in depth. June 14, 2013 • CATEGORIES: News • TAGS: 2013-May-June-Trip. Ann thought this was a good idea. Gotta humor her sometimes. 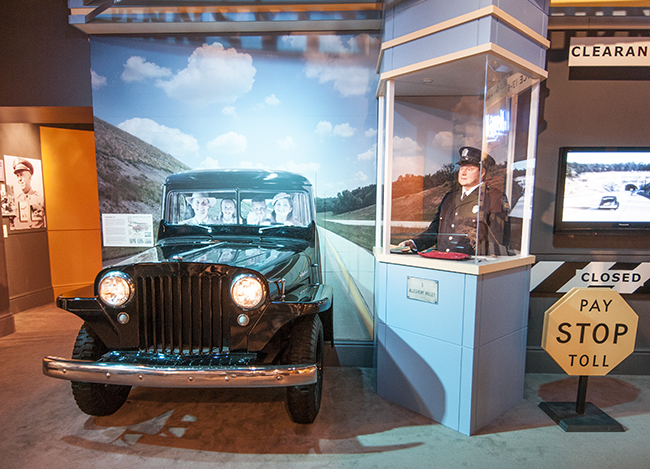 We stopped by the Heinz History Center Thursday June 13th in downtown Pittsburgh, but not after a little adventure. At one point SIRI highlighted two competing exits. Unsure which one to take, we guessed wrong had to drive an extra fifteen minutes. That SIRI is one tricky ‘helper’! When we finally arrived we couldn’t find any parking. Fortunately, my wife is broken, so we have the handicapped pass. Otherwise, we’d have driven away. 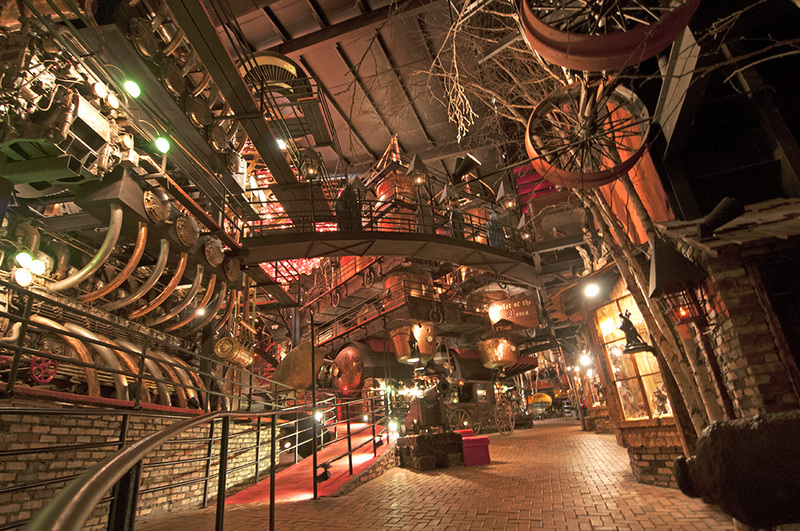 The museum specialized in Western Pennsylvania history. Gerald had recommended we stop by and mentioned there was a jeep. So, I wasn’t surprised when we walked into the lobby and spotted a jeep right away on a first floor display. It turned out to be #1007 BRC-60. 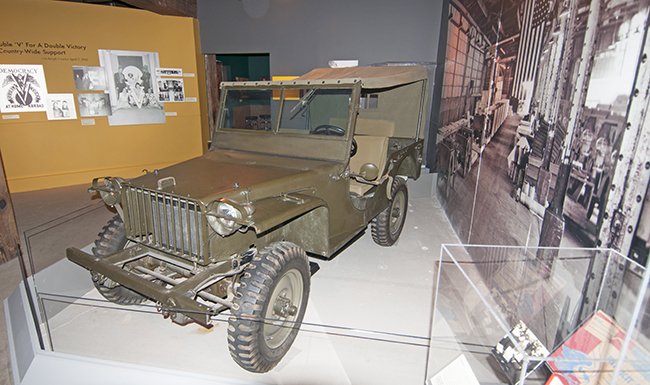 That means it was likely the 8th jeep ever built. 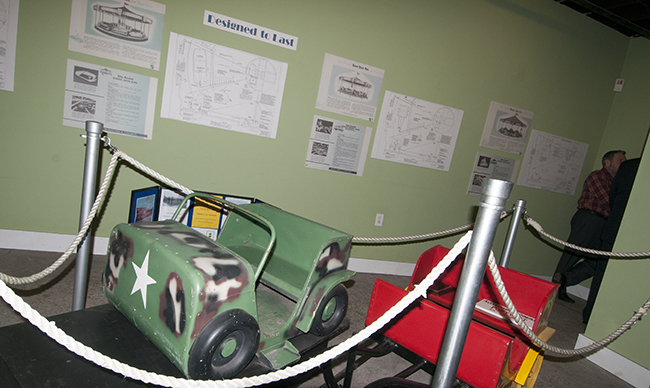 It was donated to the museum in 1944 and looks in great shape. I wasn’t prepared for the other jeeps we saw. 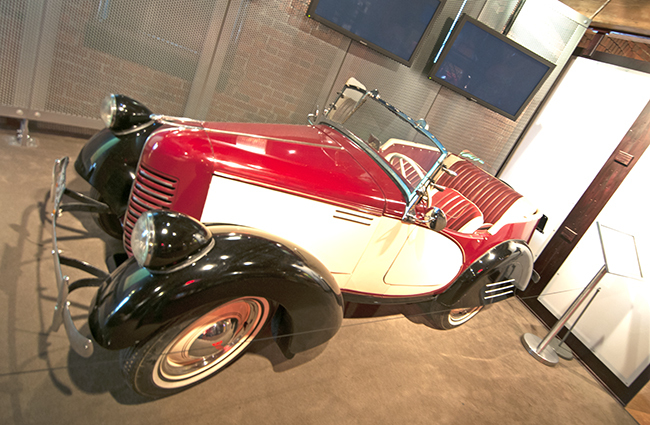 On the second floor we encountered a beautiful Bantam Speedster. I think my name was on that one somewhere. I was all ready to take it for a spin. Next we spotted a Bantam BRC-40 (third generation Bantam jeep). 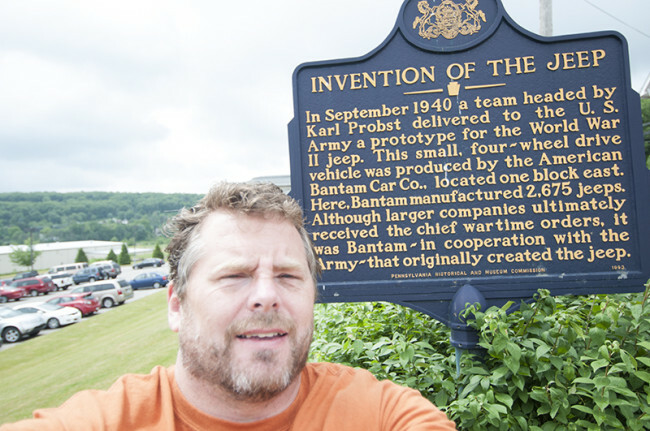 Note the Bantam factory photo to the right. I’d hoped to find something in the gift store with Bantam on it, but there was nothing :-(. Eventually, we landed in Canton and Bob and Mindy’s for the night (thanks for dinner Mindy!). Bob and Brenda joined us as well and we had a wonderful evening. On Friday morning we drove to the Bantam Festival. The shock of rising at 6am on Friday was too much for Ann, as she is now sacked out in the tent. More from the Festival tomorrow. June 13, 2013 • CATEGORIES: Features • TAGS: 2013-May-June-Trip. A beautiful Kaiser Darrin. Arrived knowing little about Kaiser Frazer cars, but left far more knowledgable thanks to Dave. 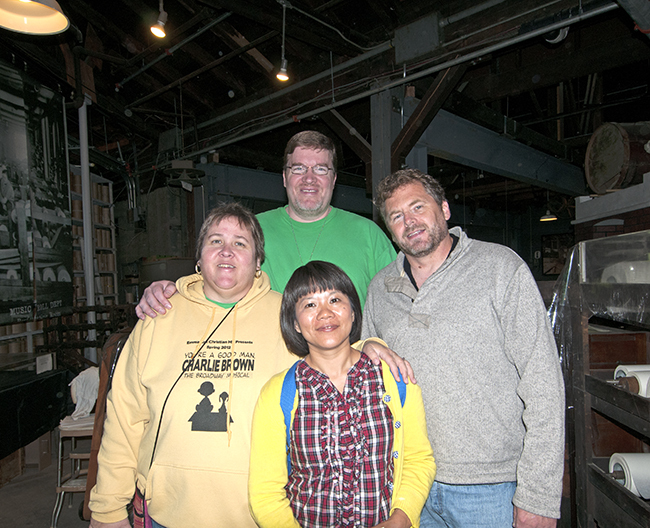 On Wednesday June 12 we visited with Dave Antram. He invited Ann and I over to check out some of the barns on his family’s 150 acre farm in Pennsylvania. Dave said to look for this sign. That way we’d know we were at the right place. His family’s been in the area a couple generations. Over time they’ve enjoyed building several different types of collections, including jeeps. As Dave welcomed us and we began our walk he noted there was a lot to show us. 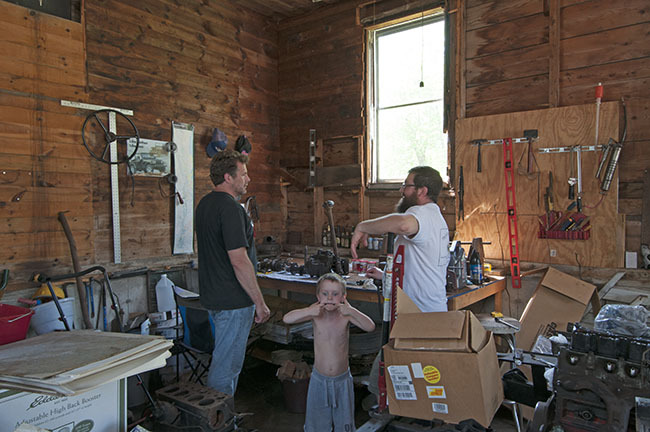 He even thought about contacting American Pickers to come visit. But, then he admitted it would be hard for him to sell anything at ‘picker’ prices. One of the early vehicles they started collection were tractors. 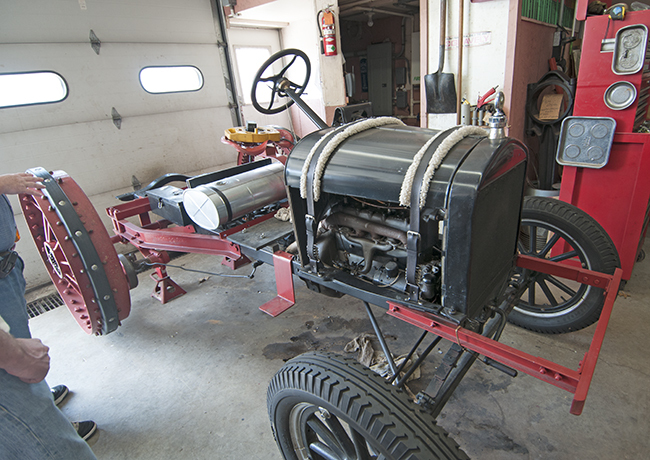 One unusual tractor in their collection employs an aftermarket kit from Sears and Roebuck to transform a 1920’s model A into a tractor. The parts painted red are the aftermarket pieces. The ones painted black are the Ford Model T parts. Model T with a tractor kit from Sears and Roebuck attached. Above the tractor collection is a model T that was purchased by the family brand new. It was in bad shape for decades until Dave’s father fulfilled a goal to restore it during the 1990s. These days they use it in parades. 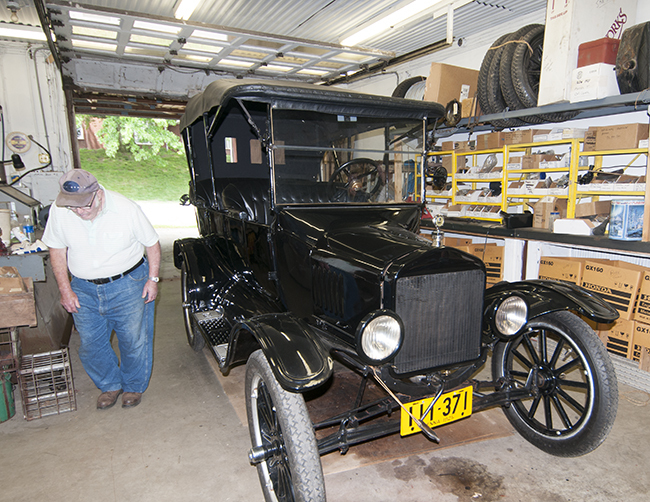 Dave’s father next to the Model T he restored. 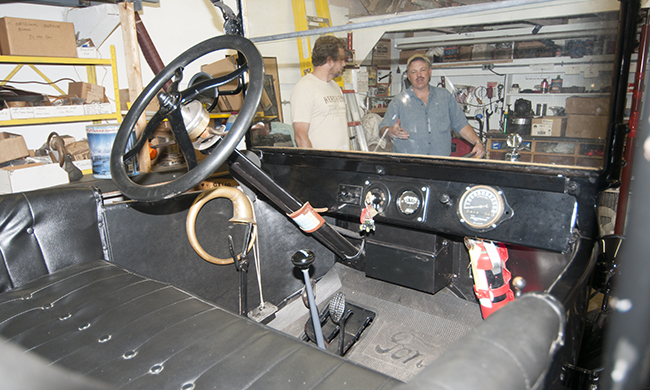 I don’t know the finer points of a stock Model T, but the quality of the restoration looked good. June 12, 2013 • CATEGORIES: Features • TAGS: 2013-May-June-Trip. 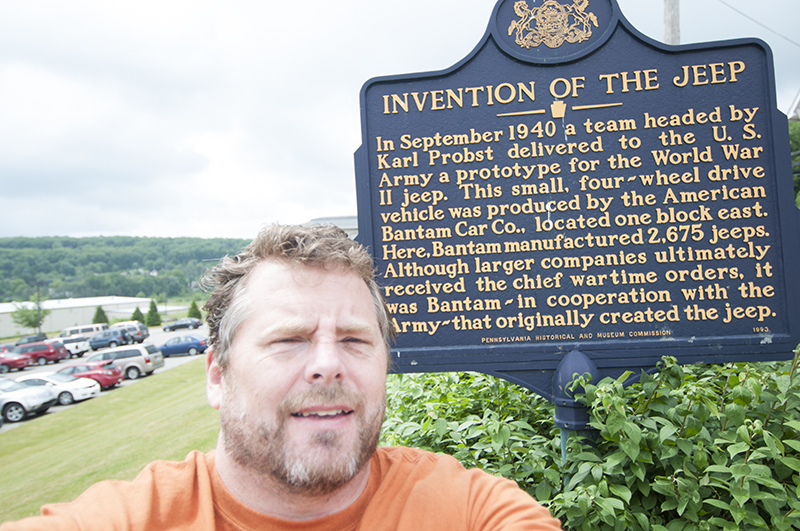 After defecting to Canada and back on Sunday, we decided to head south on monday toward the jeep-mecca-that-is-Bantam: Butler, Pennsylvania. Though we’d spurned Canada, the country seemed to haunt us. I guess we were there long enough to look Canadian. For example, when we stopped by Starbucks Monday morning (June 10th), we were told by a cashier that we could go online and get Starbucks Cash (or points or something) for completing a survey. He then announced the cash (or points) were good in Canada, too. Ann and I looked at each other wondering why he thought we were Canadian. 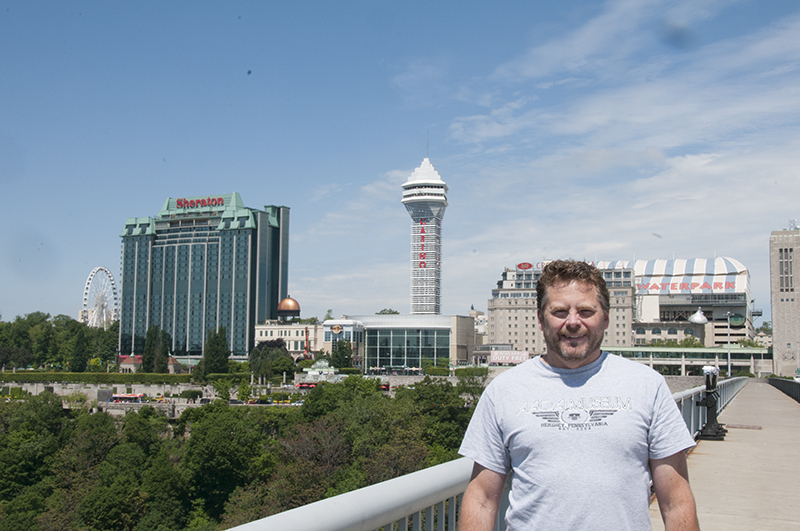 Then I realized I was wearing a “Canada” shirt. From Buffalo, NY, we drove south through rain until we got bored of the Interstate. I spotted a town called North East, PA. Thinking that was an odd name, especially since it was in northwestern Pennsylvania, we decided to venture toward it. It was a strange town. 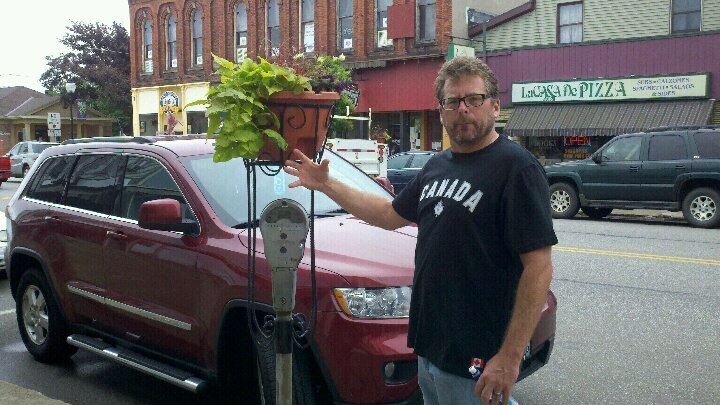 For example, they grow plants over their parking meters. We tried to visit their nearby railroad museum, but no one was home. There weren’t any hours posted on the door either. They did have lots of trains and a train station as well. 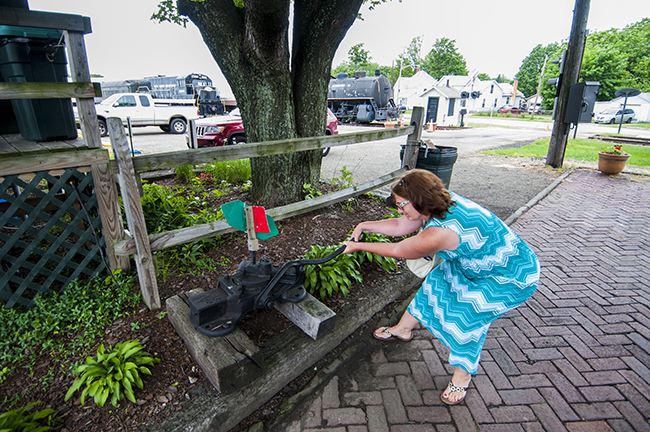 Here, Ann is sharing the finer points of shifting a train track (I’m sure there is some technical name for that). I just hoped that she didn’t hurt her knee! 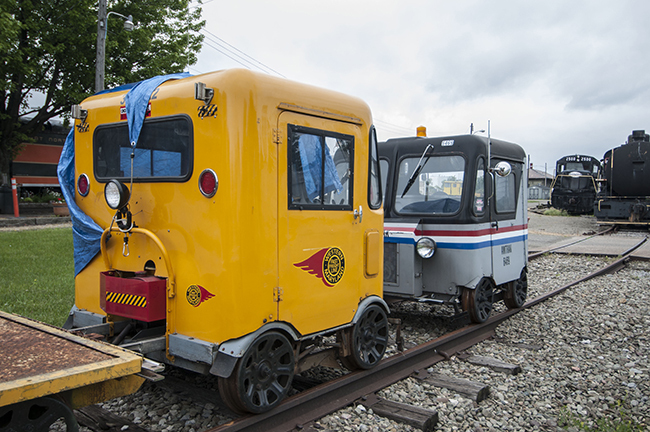 They did have several Fairmont built rail cars. I think these two Fairmonts are about to throw down and fight. From North East we drove southwest until we reached Erie, PA. We had planned to check out their maritime museum, but decided we didn’t want to spend the money. So, we looked upon Lake Erie, which satisfied our goal of seeing all five Great Lakes on this trip! June 10, 2013 • CATEGORIES: Event, Features • TAGS: 2013-May-June-Trip. 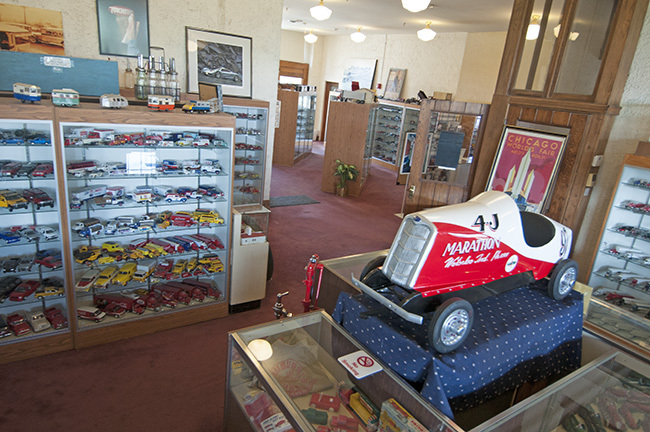 Sunday 16th: Leave around noon, drive to the Packard Museum in Ohio, then stay somewhere. 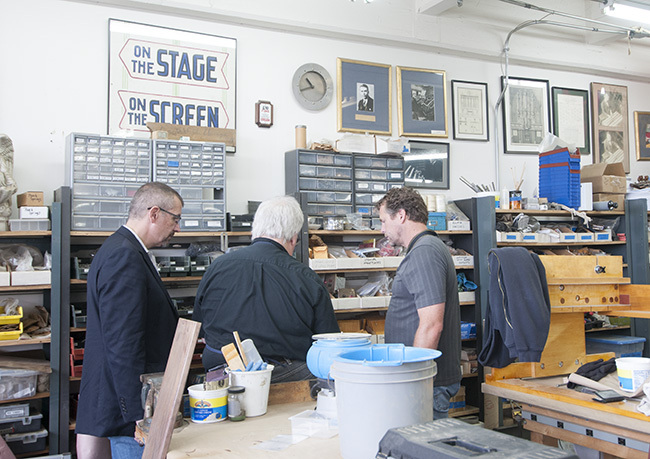 Tuesday 18th: Visit Jeff Weilers Theatre Organ restoration shop in downtown Chicago: visit volo museum in afternoon: drive to Madison, WI and spend the night. 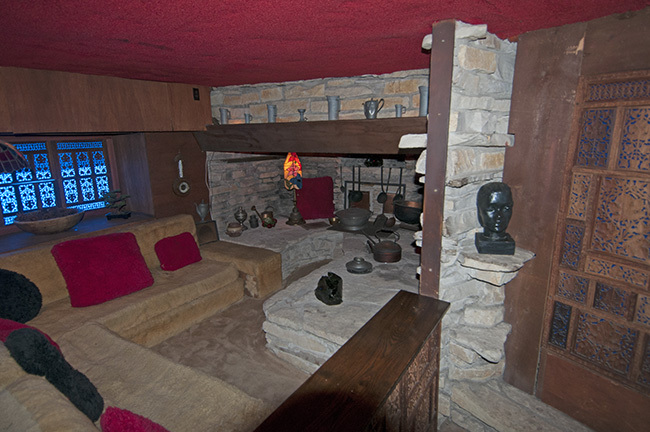 Wednesday 19th: Visit the House on the Rock near Dodgeville, WI, Drive to Iowa (final destination undecided. Thursday 20th: Visit Ann’s friends in Omaha. Friday 21: Drive to Dinosaur National Monument. June 10, 2013 • CATEGORIES: Features • TAGS: 2013-May-June-Trip. For our entire stay in Buffalo, the weather has been wet in varying degrees. So, we decided to defect to Canada. We are standing on the Rainbow Bridge. The trek to our new country wore on us, but we continued marching! As if the sirens were wooing us, the closer we got to Canada, the better the weather became. We took it as a sure sign we were doing the right thing. Once Ann and I located a parking spot (free even!) we abandoned our car and our American lives to embark on a future as Canadians. It turns out it’s easy to leave the US on foot. We just passed through a simple turnstile and we were home free! Like a couple of refugees, we packed light, carrying only the bare essentials (cameras and cash) on our forced march across Rainbow Bridge (we couldn’t bring the jeep across — it was too new and the bank that holds the loan wouldn’t give us permission). Look at that great view! Behind us is a Canadian playground awaiting our arrival. We left behind the sunny the rainy skies of Buffalo for the beautiful blue of Canada. By the time we were halfway across the bridge, the sun was shining bright. The mist from the falls saluted our decision, welcoming us in a very friendly manner into the Canadian fold. “OH CANADA” we bellowed as we approached the passport office. Behind the desk at the office was a pretty blond who welcomed us (Canada was looking pretty good by that point!) — No wonder Canadian Dave loves his country so much! The Canadian’s appear to be very neat and tidy. I wonder if all their lawns look like this? After sizing up Canada’s newest citizens, the immigration official let us in. 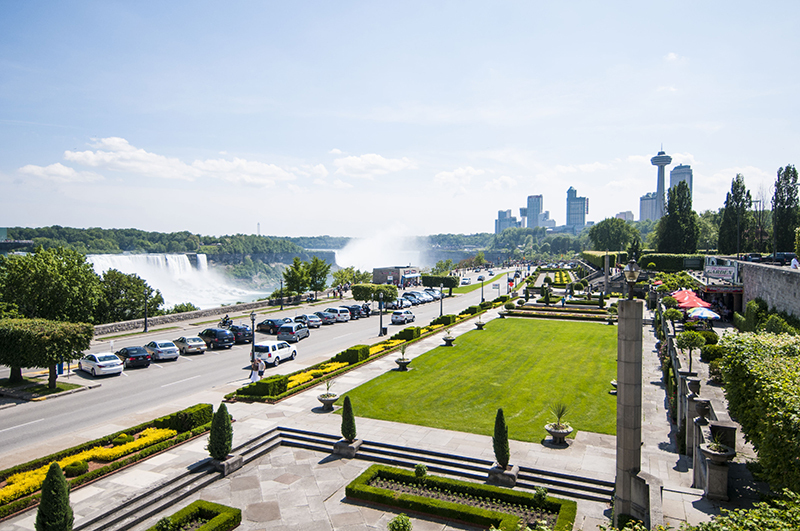 We couldn’t wait to breathe the Canadian air, eat the best of Canadian food, and see the world through their eyes. June 8, 2013 • CATEGORIES: Features • TAGS: 2013-May-June-Trip. Forrest Gump was right: Life is like a box of chocolates; you never know what you’re gonna get. When I began this trip I never expected to be on the front page of a town’s newspaper. As I noted yesterday, I feel fortunate it was a slow news day! I did note there were a few quotes attributed to me worded in a way that I’d never do, but that’s the good/bad of being interviewed. 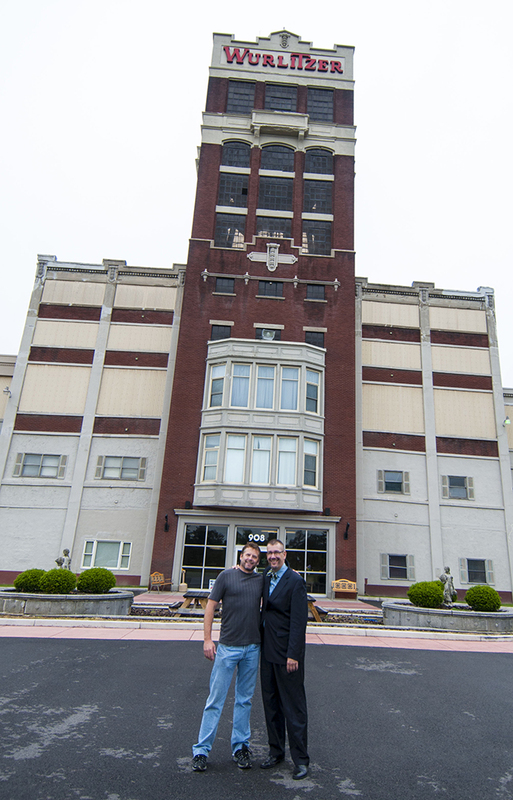 On Friday morning Ann and I were scheduled to visit the Wurlitzer Building in North Tonawanda and enjoy a brief tour by the President of the company that owns and operates it. 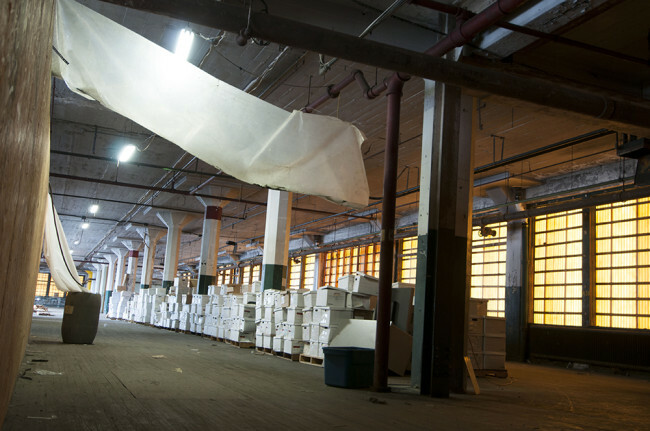 While many square feet have been turned into office space that’s leased to companies, thousands of square feet remain empty, awaiting a reason to transform it back into something leasable. At building is huge (I can’t remember the exact size), but at one point it employed over 3000 people. You can read a fuller history of the Wurlitzer Company in North Tonawanda from 1892 to 1942 here. This is only part 1/5 (?) of the Wurlitzer building in North Tonawanda, NY. It’s the entrance. 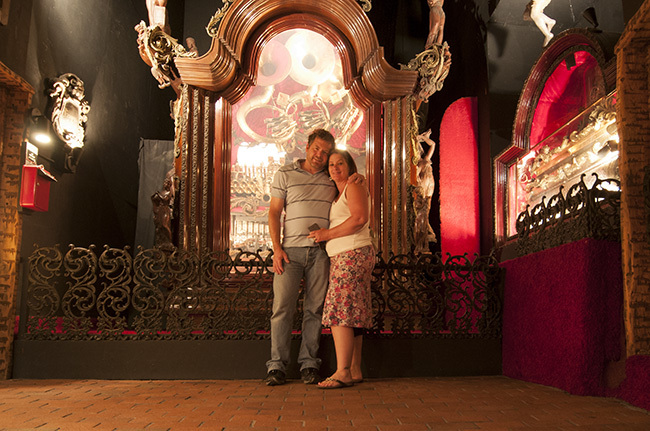 Here is organ restoration specialist Jeff Weiler and I in front of the entrance. 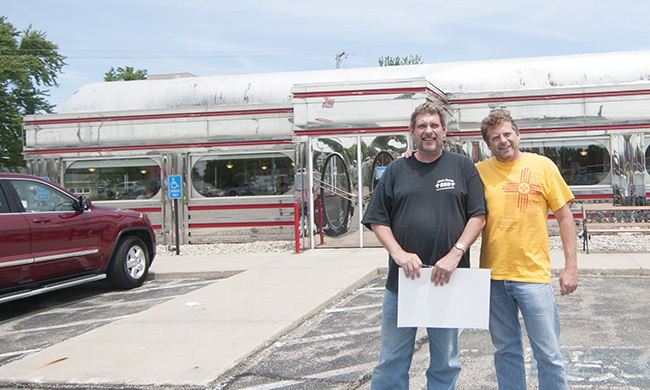 Ann and I plan to meet up with Jeff and see his restoration shop in Chicago during our trip back home. 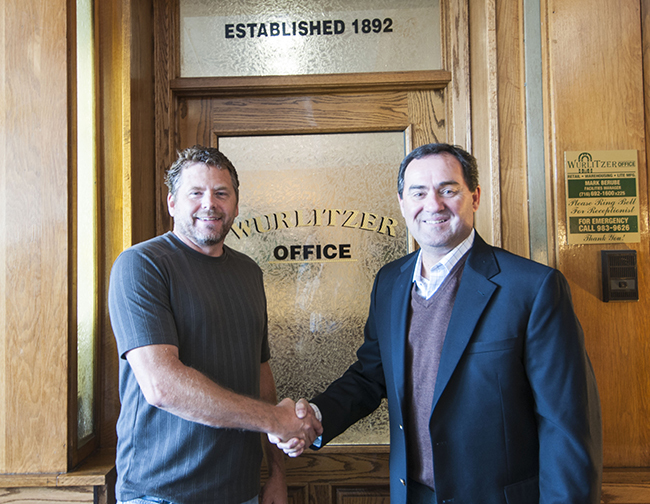 This is President of The Wurlitzer Building Tom Austen, who showed us around a portion of the building. This is one wing of the 3rd floor that is empty (except for some file storage). June 7, 2013 • CATEGORIES: Features • TAGS: 2013-May-June-Trip. 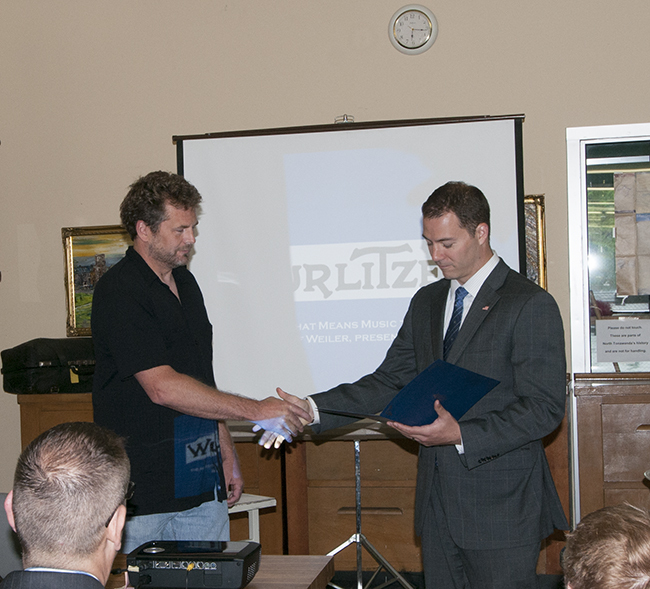 My presentation of the Wurlitzer Plaque to the North Tonawanda History Museum Trustees. I’d like to share with you all the wonderful things I did on my birthday — of parties, food, and lavish gifts — but the present I truly longed for was sleep. So, that’s pretty much all we did. We slept. A lot. By June 6th we were ready for a busy day. Our first stop was at my great uncle Farny Wurlitzer’s former house in North Tonawanda, NY. 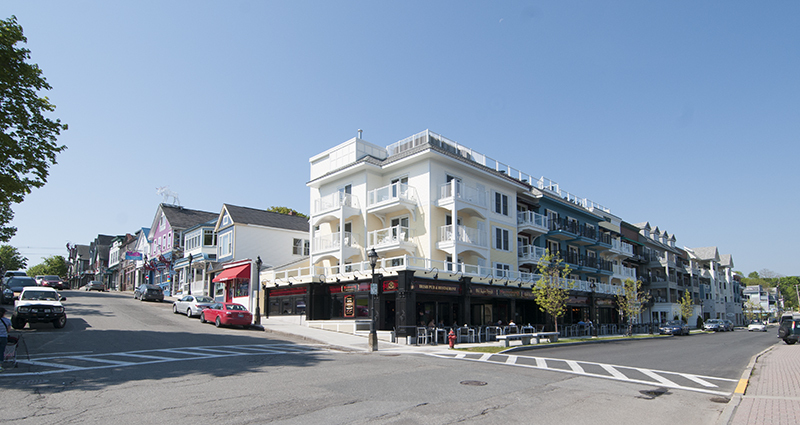 It was a beautiful place that was recently purchased by new owners. I won’t bore you with the pictures, but it was fun for us. After the house visit, as official representatives of the Rudolph Wurlitzer family (I’m his great great grandson), Ann and I were invited on guided tour of the Herschel Carousel Museum in North Tonawanda. The front of the Herschel Museum (on a very wet day). 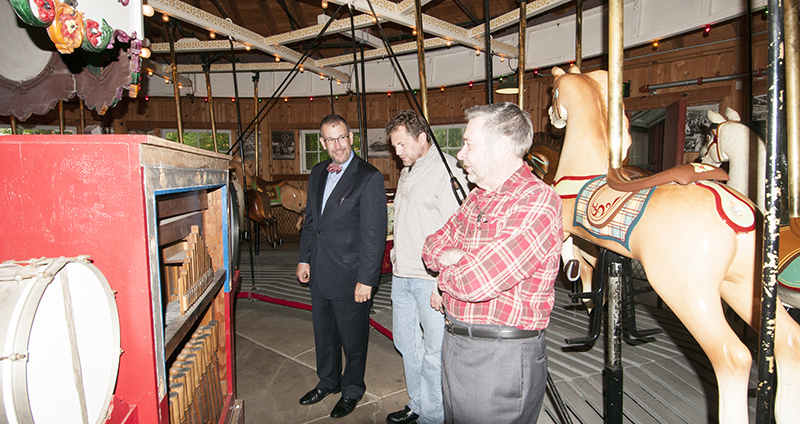 Doug, Jeff and I are examining a Wurlitzer Carousel Organ that plays while the carousel spins. 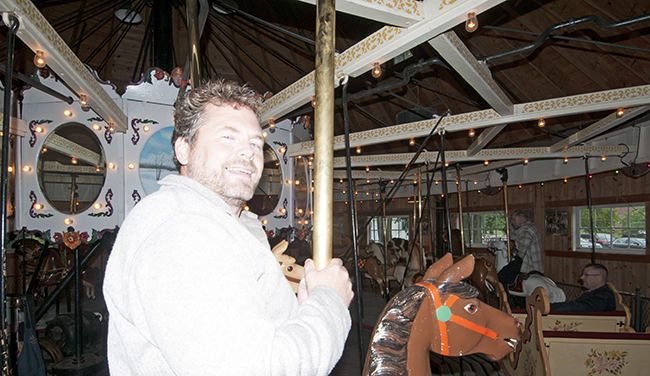 Who doesn’t feel like a kid riding a carousel?? 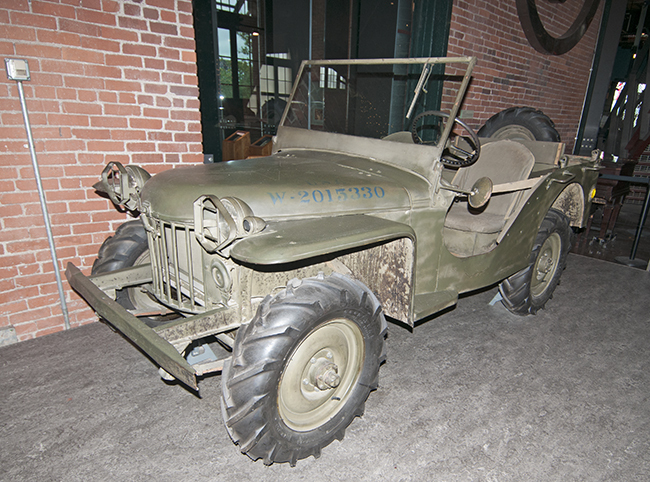 Of course, we even found a jeep at the museum! A little known fact was that most of the carousels built in the United States came from North Tonawanda (we were told 99%), constructed by four different manufacturers. One of the music suppliers for the Carousels was Wurlitzer, which created automated ‘military bands’ using punched paper to play different songs. 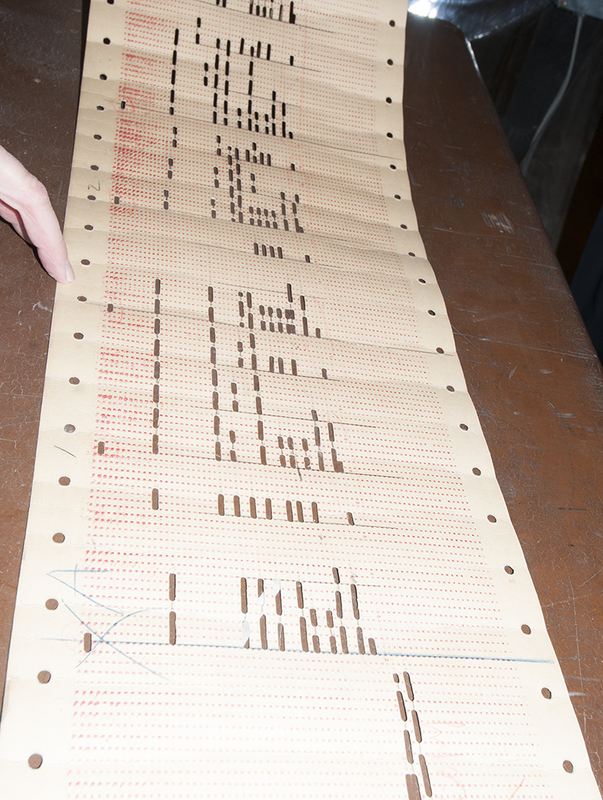 It’s best described as very long punch card. 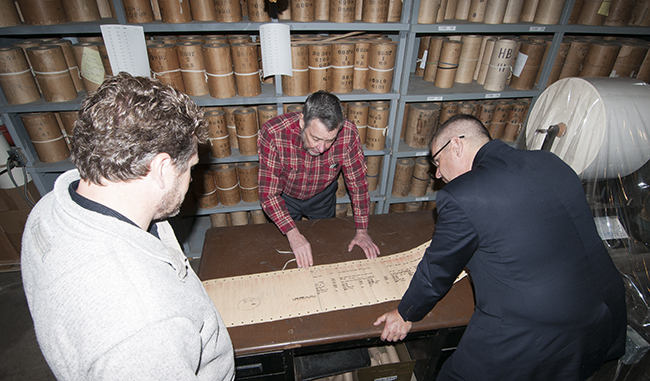 Here is Doug showing Jeff Weiler (Wurlitzer Theatre Organ restoration specialist) and I a master roll. We are examining a master roll that contains multiple songs. Player rolls are made from this master. The master is HAND STAMPED! A closeup of the player roll and its punched holes. 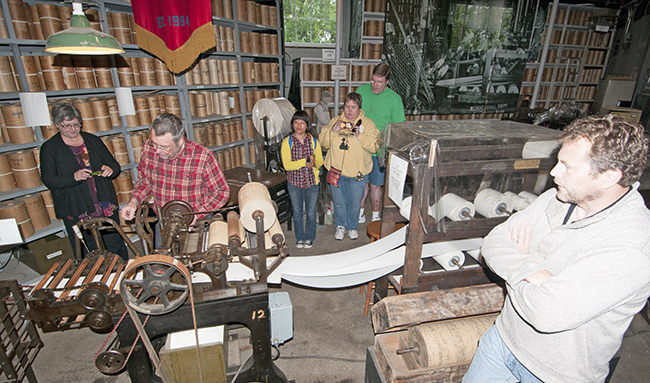 The Herschel museum has two of the original machines used to create the paper rolls and has spent years re-learning the art of turning a master roll (which might contain several songs) into the paper rolls played by the machines. Here’s the master roll dictating how the white paper rolls should be stamped. Some folks from Ohio wandered into the museum to escape the rain. When they found out I was a Wurlitzer descendant, they wanted to have a picture taken with me. The small woman at the very front is from Taiwan and had no clue what the big fuss was about (I’m not sure what the big fuss was about). I’m sure this will appear on facebook somewhere . . .
After the Herschel Museum, we attended a presentation by Jeff Weiler on the history of Wurlitzer Theatre Organs. 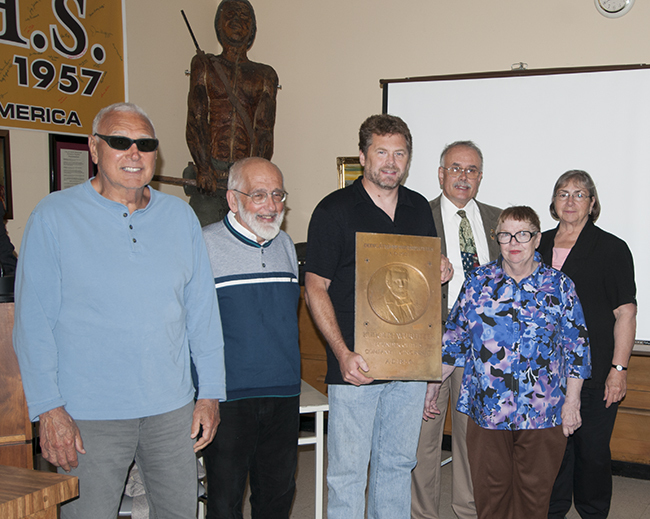 Just prior to that presentation, I formally donated the Wurlitzer Plaque saved by Nick Arbusio to the North Tonawada History Museum. In turn, both the Mayor of North Tonawanda and a Niagra County Councilman thanked me with proclamations. Unfortunately, neither keys to the city nor a Disney trip accompanied the proclamations. The Mayor and I . . . it must have been a slow political day. 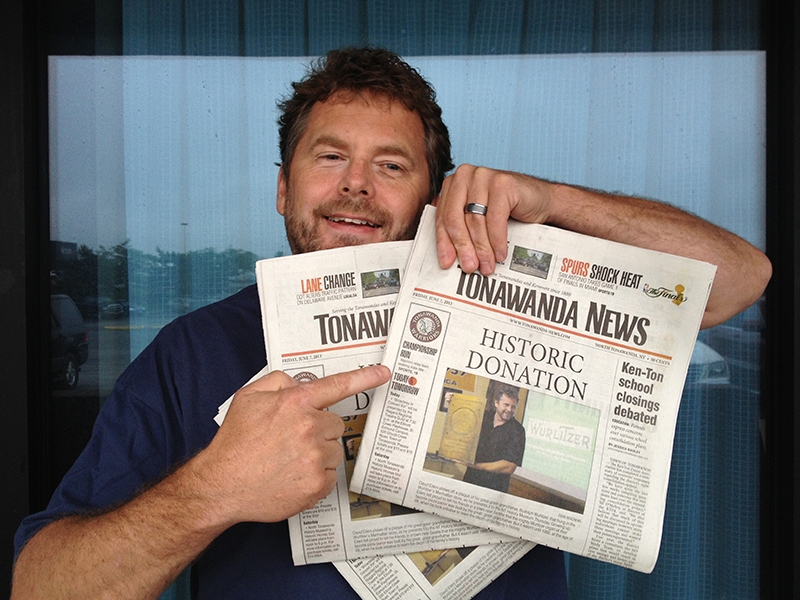 A local newspaper reporter covered the breaking news of our plaque donations . . . It must have been a slow news day. June 5, 2013 • CATEGORIES: Features • TAGS: 2013-May-June-Trip. 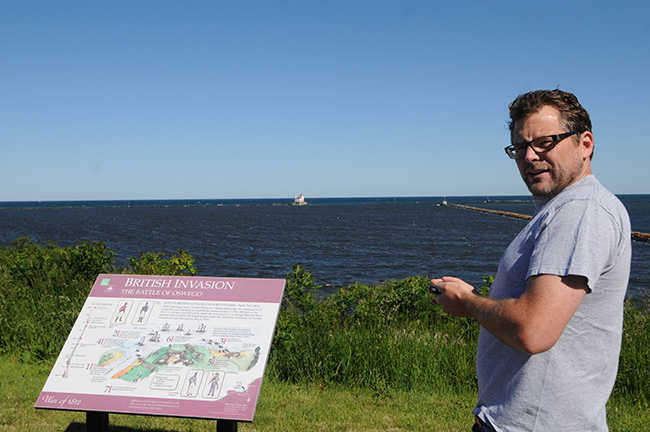 No, the sign isn’t referencing the Beatles; it’s explaining an earlier invasion by Brits playing musical muskets. Last night I got a really good deal on a motel room in Pulaski, NY. Strangely, no one else showed up at the motel. We had the entire place to ourselves. To make it odder, the supposed two-star place was only of one-star quality. The whole place had an odd vibe. We got going pretty quickly this morning. 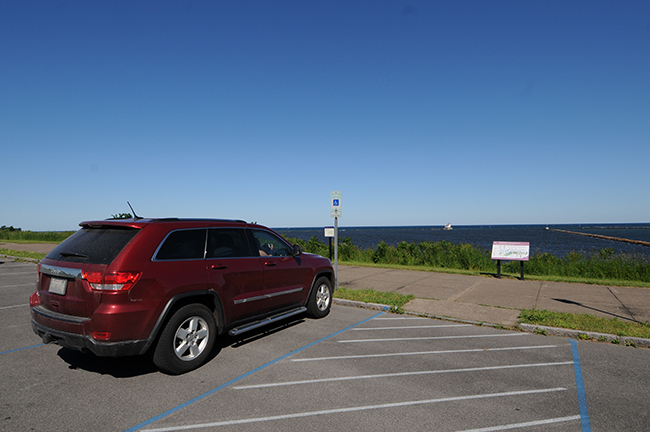 Our first stop today was the beach at Oswego, NY, near Fort Ontario. There we looked out onto the fourth Great Lake of our trip: Lake Ontario. The warm temperatures of the past few days turned to a cold one this morning. It was 67 degrees! Brrr. We almost had to put on jackets. Henry taking a well deserved rest at Lake Ontario. From there we drove to the State University of New York at Oswego. 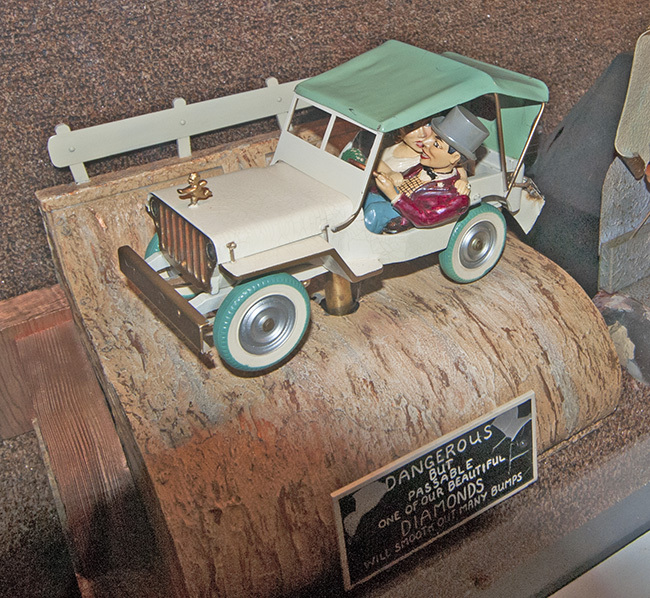 There we talked with a reference librarian in hopes she could find more information on Dorothy Rogers, the author of Jeopardy and a Jeep and Highways Across the Horizons. The librarian provided some reference material that led to additional biographical information. So, the search is ongoing. After our library trip, I was hungry. 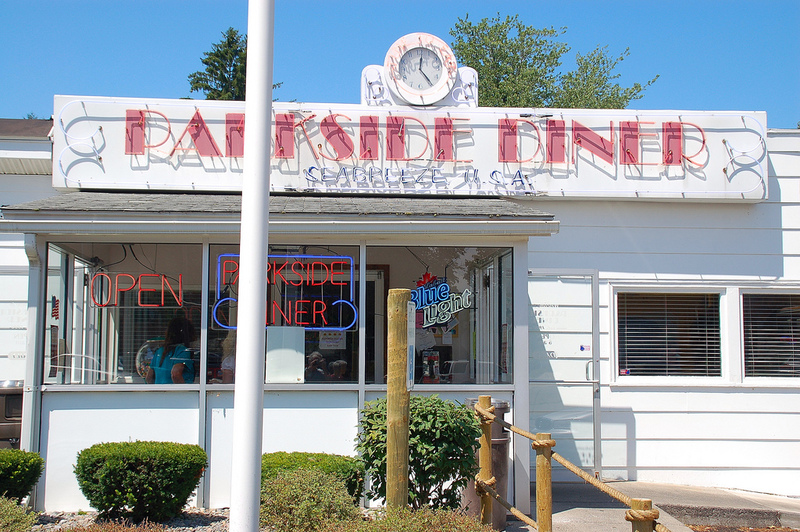 Yet, we managed to drive all the way to Seabreeze, NY, where we found a diner near a park called, not surprisingly, the Parkside Diner. They fixed some good diner food. The strange part about our experience was that as we waited for the check, Ann and I started to hear some strange sounds from the booth in back of us. It sounded like a little kids TV show that seemed, intellectually, one step above Teletubbies. The sounds were loud enough that the grating voice would have disturbed us if we were still eating. Just before we left, I took a picture of them. Here is my stealth photo. If you see these two ‘kids’, be aware that they have no awareness for others around them. The red colored photo is propped up against the white container of sugar. 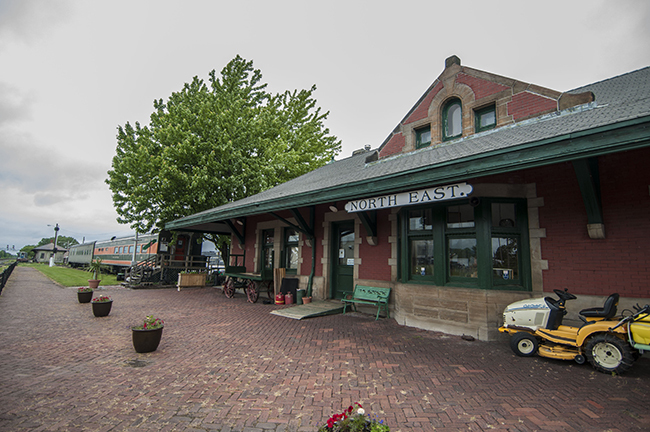 We arrived in Northeast Buffalo soon after our lunch. We napped and then I worked on eWillys. 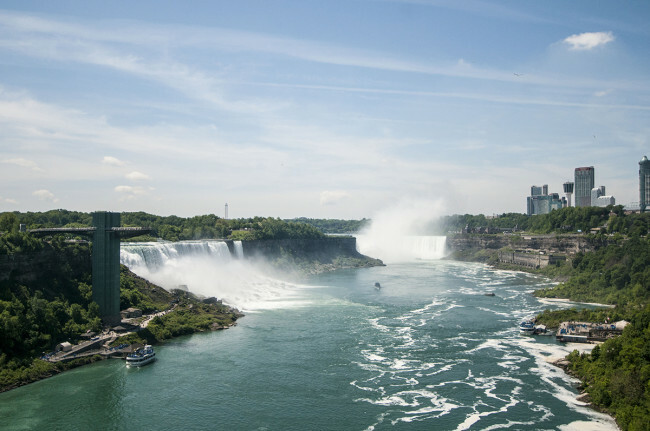 We’ll be here through Saturday driving back and forth between North Tonawanda, NY. There won’t be any updates on Thursday morning, since tomorrow is my birthday. I’m 48. I don’t quite know how that happened! June 4, 2013 • CATEGORIES: Features, Museums • TAGS: 2013-May-June-Trip. Ann and I started the day in Burlington, Vermont. 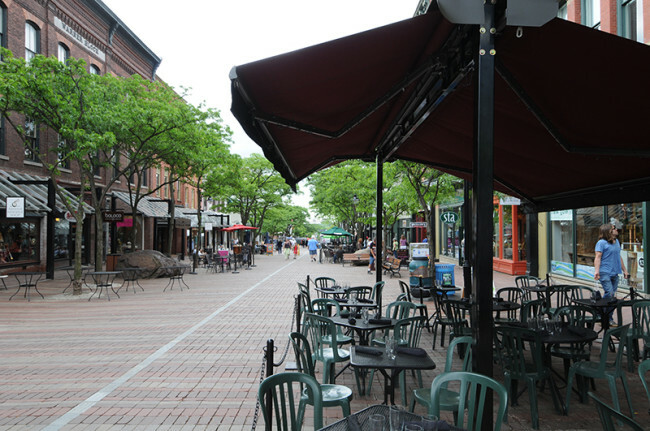 As we left our hotel, we decided to wander the streets of Burlington and find some iced black tea. So, we hit the walking mall in downtown Burlington that we’d spotted when we arrived on Sunday evening. As soon as we stepped onto the plaza, we loved the place. Even on a monday morning with temperatures in the mid-60s, people were walking around. Many restaurants had sitting areas arranged in such a way that it reminded me of the small towns in Eastern Europe I’d visited back in 2003. This shows the southern half of the outdoor mall. 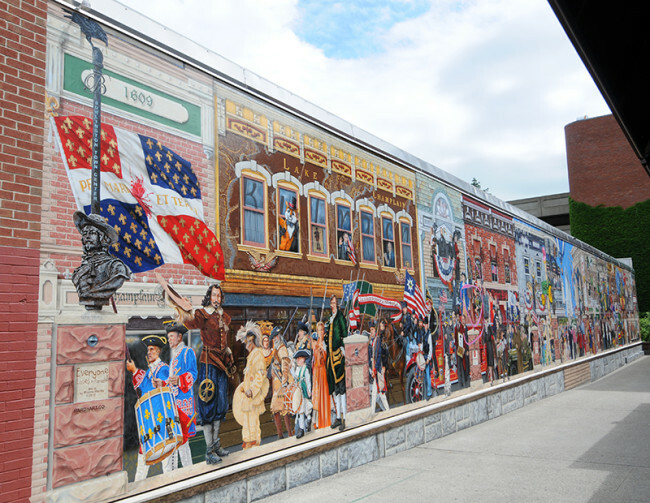 I spotted a jeep in this long mural on a wall in Burlington, VT.
We eventually found some black tea at a dark, cool coffee shop called Muddy Waters. The tea was good and the atmosphere unique. We followed up the tea with some bagels. 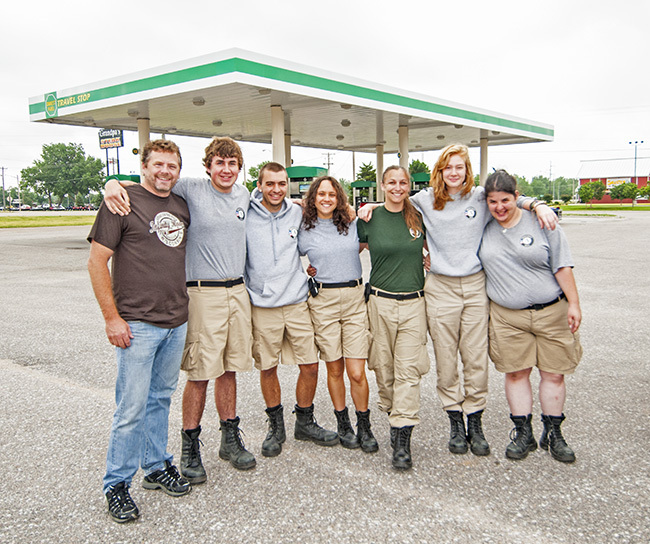 After our walk through Burlington, we were intent on getting into the jeep and driving, because we had about five hours to drive. 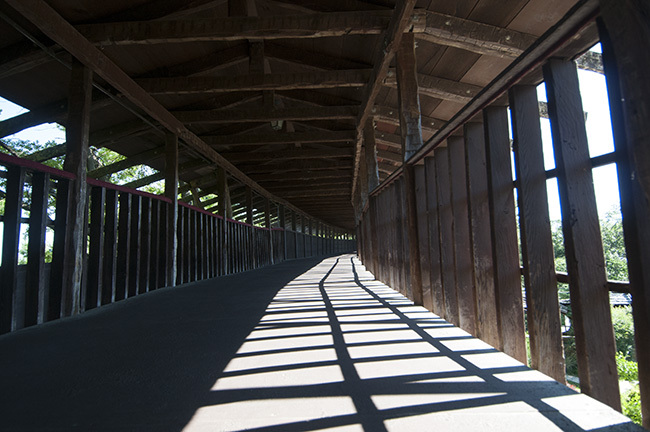 We made it all of fifteen minutes when we spotted a beautiful covered wooden bridge. Ann immediately wanted to take a picture of it, but we had to figure out how to reach it. As we drove, we discovered several more buildings separated by beautiful landscaping. All were behind a big fence. Eventually it dawned on us we were looking at a museum of some kind. 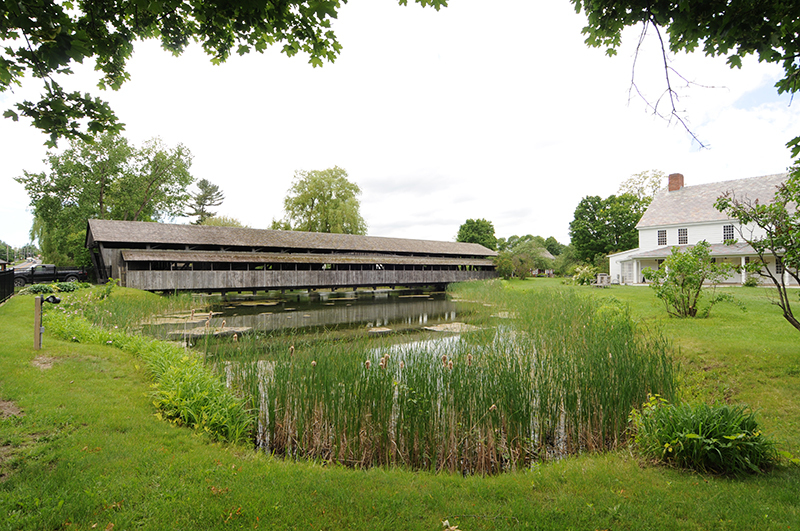 This is the covered bridge we’d spotted from the road. June 2: State #49 Was Exciting! June 3, 2013 • CATEGORIES: Features • TAGS: 2013-May-June-Trip. Upon stepping foot onto the last of the lower 49 states I hadn’t visited, I gave the welcome sign a hug. Truth be told, the grass was too wet for me to venture into it. We started out the day with Ann sneezing. It ended with her sneezing. In the middle, there was lots of sneezing. Either she has a cold or she’s got some terrible allergies (the grass pollen is particularly high she says). Poor thing! In between the sneezes we navigated down I-95 from Bangor, Maine, to Hollis Center, Maine, where Brendan, the operator of This-Old-Jeep, lives. He and I have exchanged many emails over the past few years. 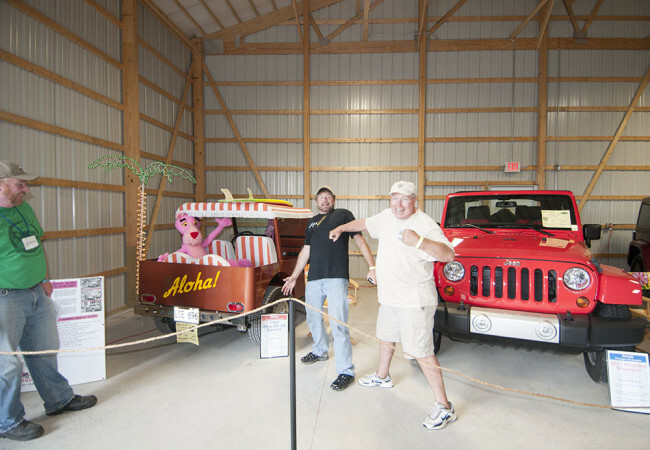 Because we both run websites using WordPress about old jeeps, we have plenty to talk about. So, it was great to finally meet him in person. We also met his wife Melissa and their two boys, Walter and Bryon. Water even drew me a picture of a jeep, which is downstairs in our jeep, so posting that will have to wait. Brendan and Melissa fixed us a nice lunch, which included Brendan’s freshly made bread. We both throughly enjoyed the home cooked meal and greatly appreciated it! 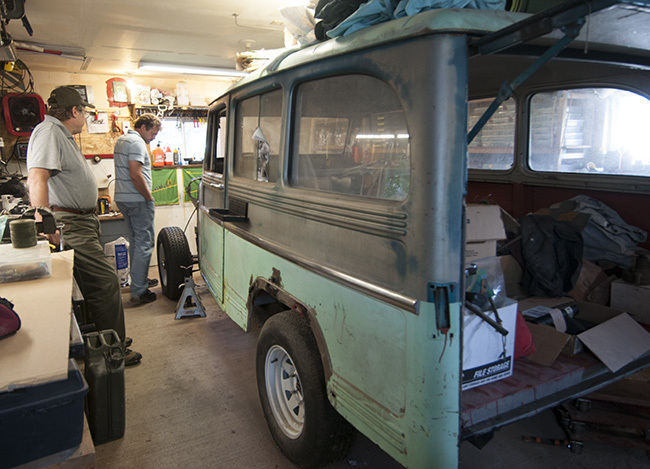 After lunch we headed out to check out Brendan’s CJ-3B project. As we were discussion his recently disassembled transmission, Byron decided to distract my camera person: He’s a bit of a ham 🙂 Many thanks to the entire family for making our visit enjoyable! Not too long after we left Brendan’s place, we crossed into New Hampshire. We reached the cute town of Conway. 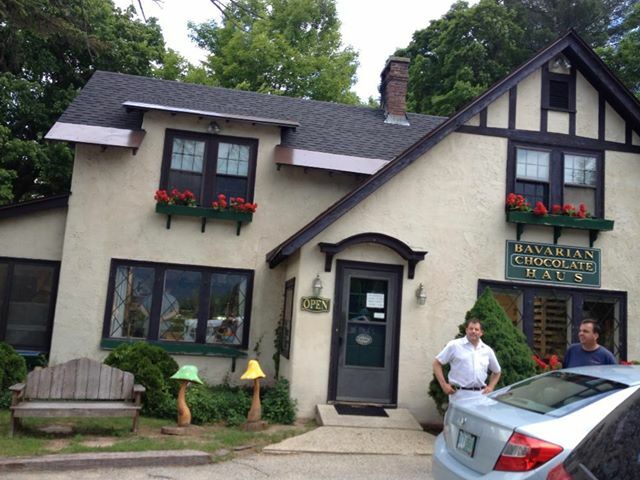 As we entered town, a Bavarian Chocolate Shop cast a spell over us and we were forced to pull over and enter into the shop. We had no choice. Twenty dollars and two pairs of chocolatey hands later, the spell finally lifted as we were on our way out of town. The dark chocolate hazelnuts were awesome! That’s when all hell broke loose. An enormous gust of wind blew past the jeep. 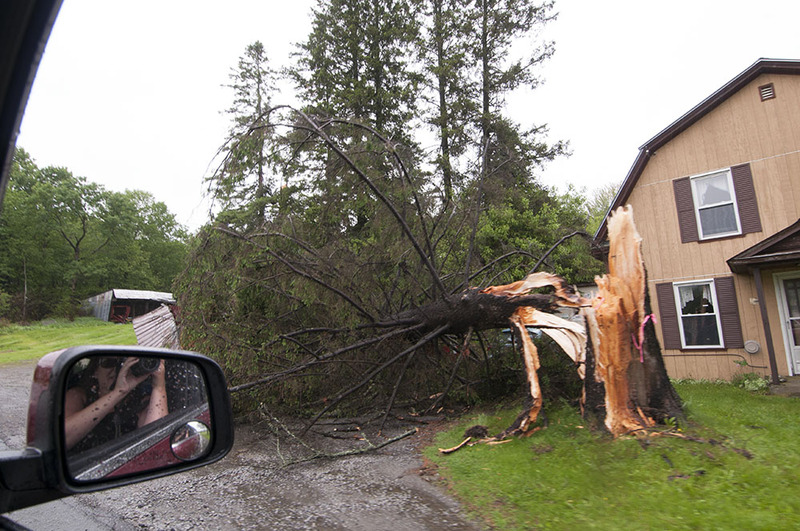 Branches were falling, rain was pouring, and cats and dogs were dropping all over. There was thunder and lightening. We began to wonder if we’d committed some sin for giving in to our chocolate lust . . . but no, apparently the storm was a left over ripple from Oklahoma. Given the enormity of the ripple, I’d hated to have been in the middle of the central splash! Speaking of Oklahoma, Karson’s on his way there with FEMA to help coordinate the relief effort. After the storm hit in Conway, we drove under and ran over multiple downed power lines. The power was out through the remainder of our drive through New Hampshire and into Vermont. Trees were down, branches covered the road, and rain continued to fall. This was along the road. The tree fell onto a building, narrowly missing the house. In other locations, people were cleaning up the mess as we drove by. Unfortunately, most of our pictures of the storm came out blurry. 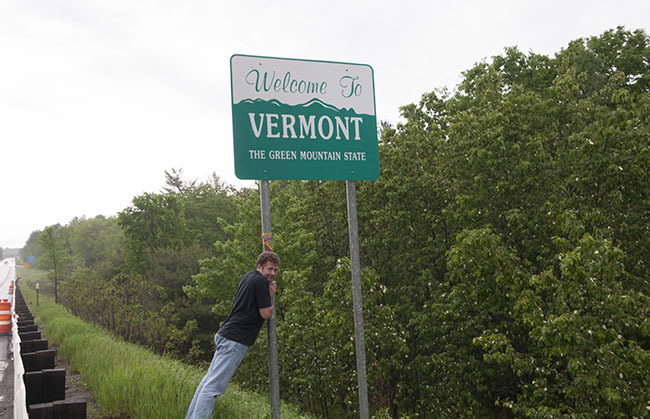 Speaking of Vermont, passing into it means I’ve visited all of the ‘lower’ US states. All I have left is Alaska! 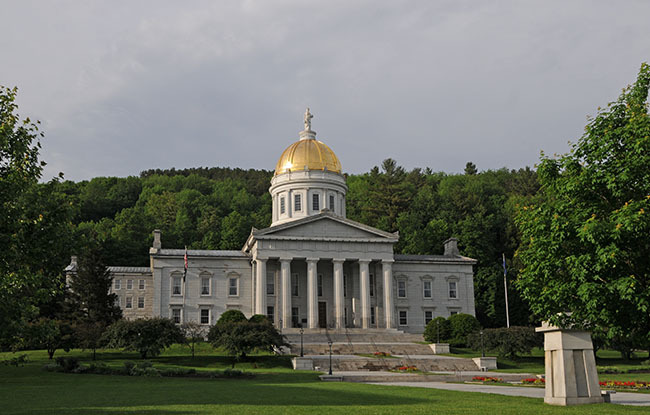 By the time we reached the capital of Vermont, Montpelier, the clouds mostly vanished and the sun shone again. We were pleasantly surprised by the quaint town. The capital building was welcoming and close to town. 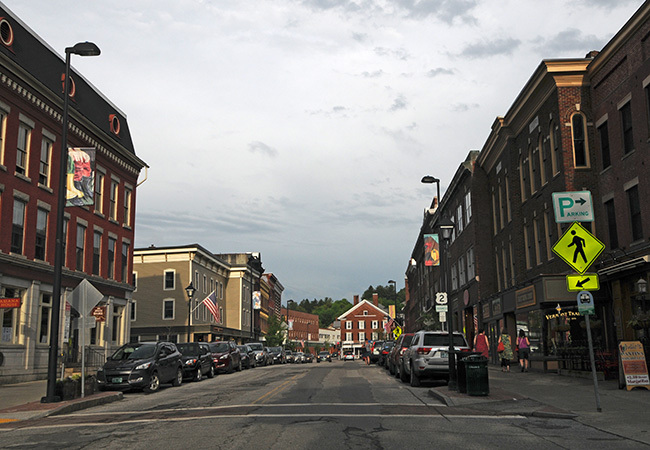 Montpelier hummed with activity as families and individuals toured its streets. We eventually made our way to the local Hungry Mountain Coop, which was a first class treat. Lots of great breads and interesting foods! After Montpelier, we made our way to Burlington, which was another beautiful city. We are hoping to explore it a little before we leave on Monday for Oswego. Here’s a view from our hotel (another great Priceline find at $51). 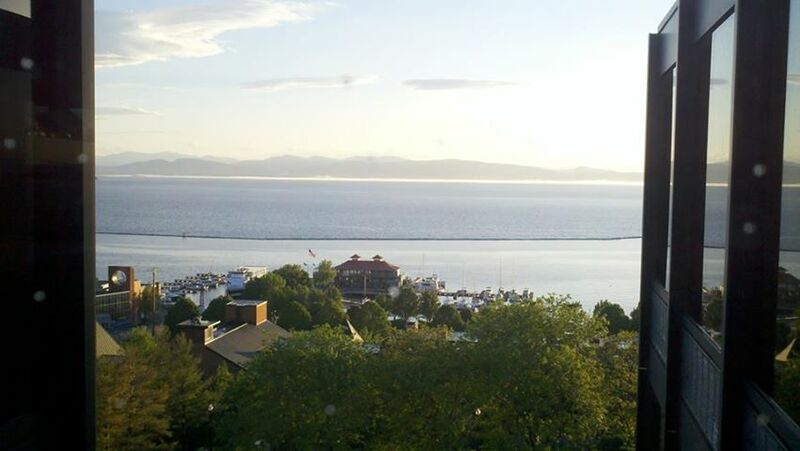 That’s the view looking west over Lake Champlain. June 2, 2013 • CATEGORIES: News • TAGS: 2013-May-June-Trip. Sunday evening we’ll be traveling to Burlington, VT. From there we’ll be going through the NY Mountains to reach Oswego, NY, monday night. Why Oswego? I am hoping to find out more about the two women who did the around-the-world tour in an FC. They were teachers at the University there. Tuesday night we’ll land in the Buffalo/North Tonawanda area. If I can get a good price, we’ll stay there a week. We’ll be preparing for the Bantam Festival and our trip home. Leaving (A) Hollis Center, ME, in the afternoon. Arrive at (B) Burlington, VT, Sunday evening. Arrive at (C) Oswego, NY, Monday Evening. Arrive at (D) Buffalo, NY, Tuesday evening. June 2, 2013 • CATEGORIES: Features • TAGS: 2013-May-June-Trip. Glenn driving his DJ-3A with Ann riding shotgun. On Friday May 31st Ann and I arrived at Glenn’s house to find Smithfield’s Breakfast Club waiting for us. 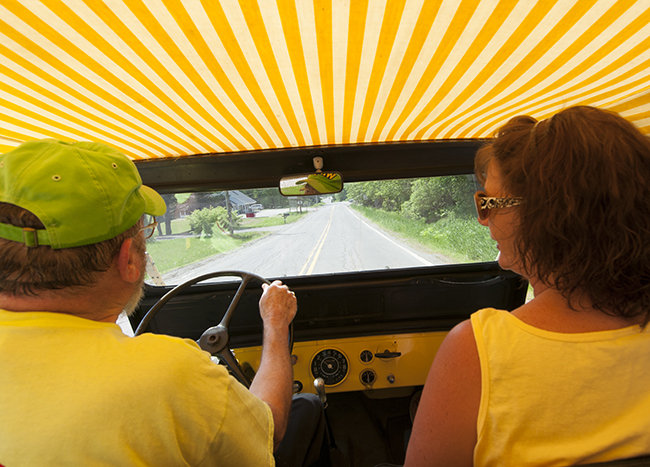 They are a group of vintage car lovers from Maine who join each other for breakfast once a week. Glenn introduced us to everyone and then led us through some of his amazing Al-Toy collection. I’ll be surprised if I ever see a larger or nicer group of cast aluminum toys than his. These are just his nicest Al Toys! 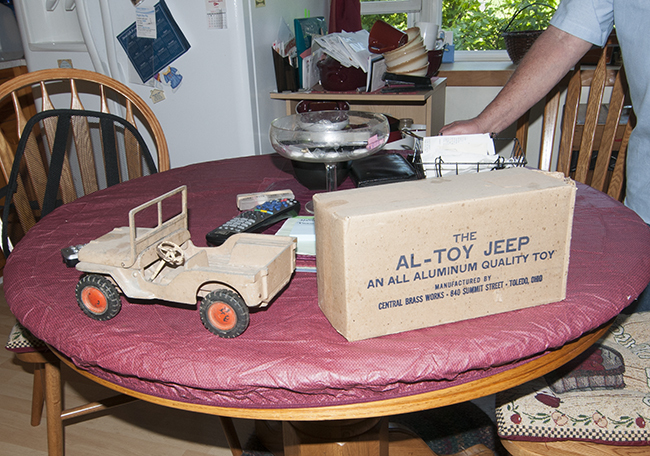 This is a very rare Al-Toy box. They are plain enough that I can understand why many were thrown away. 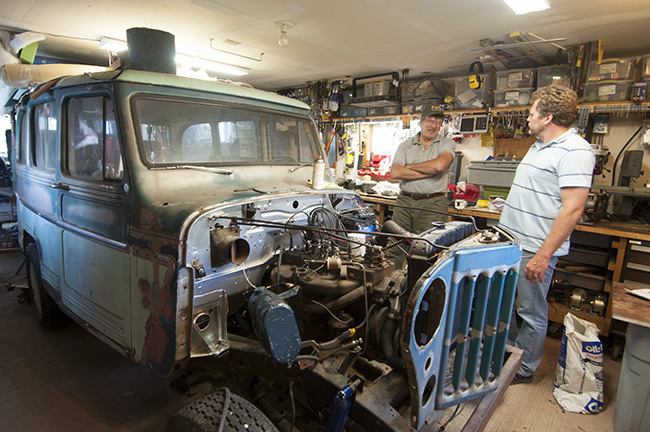 After the quick tour, we went to visit Mike and see his Shenecker Backhoe Truck project. Glenn took Ann and I in his DJ-3A (after we got it jump started). Ann and I arrived last night (May 31st) after visiting Glenn to setup CAMP EWILLYS. As you can see we even had a banner! 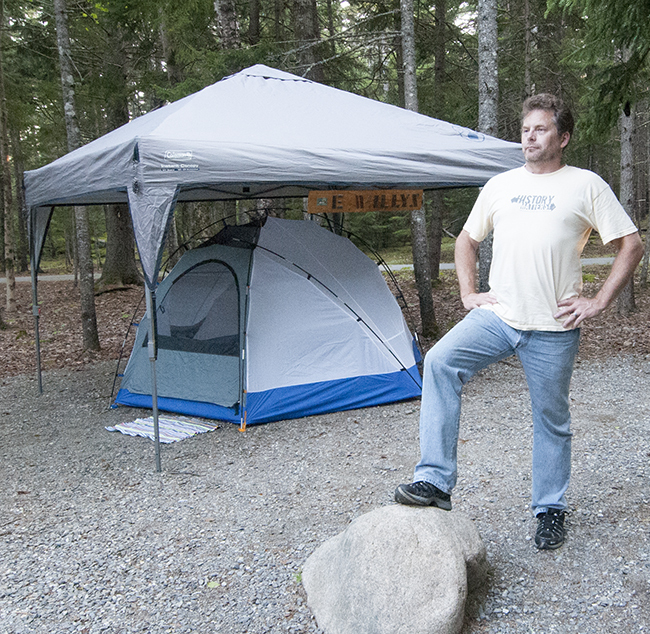 It is our two-night home in the Blackwoods Campground of Acadia National Park. 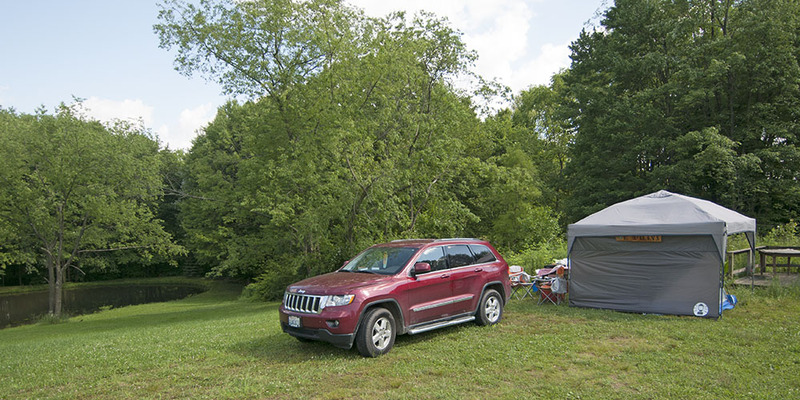 The campground was sparsely filled both Friday and Saturday nights despite the 80 degree weather. We were thankful for that, because this area has more than 300 camping spots! My plan was to visit the Park’s Visitor Center yesterday when we drove onto Mount Desert Island (the park covers about half the island). At that time I mentioned to Ann that I’d had a problem locating the Visitor Center online. So, I figured there would be some signs to help guide us. However, we quickly got lost. Also lost was cell reception. Even our Atlas didn’t help. We nearly had to resort to asking for directions when a sliver of bandwidth sneaked onto our phone, which allowed us locate the Blackwoods Campground. So, at least we found home. 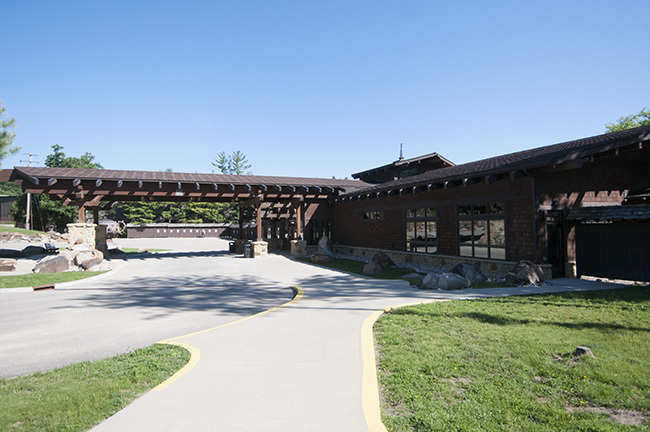 But, where was the visitor center or at least an entrance station? The next morning (June 1) we hit the road for an early morning visit to Bar Harbor. 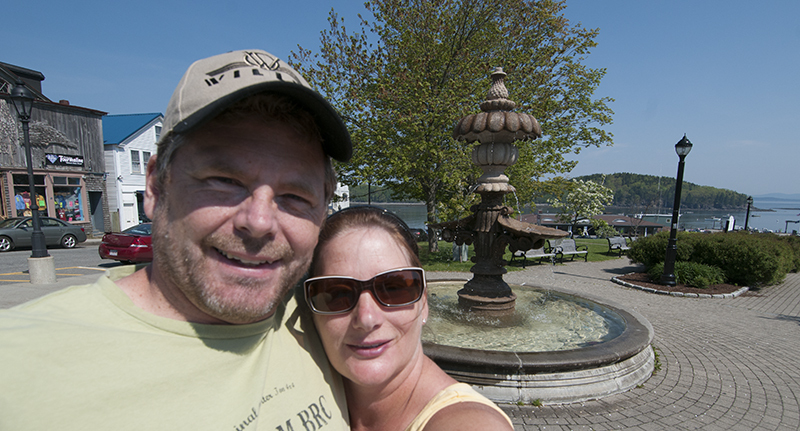 Here we are at a downtown park. This was taken near the harbor. We enjoyed the seaside town and it’s relaxed flavor. 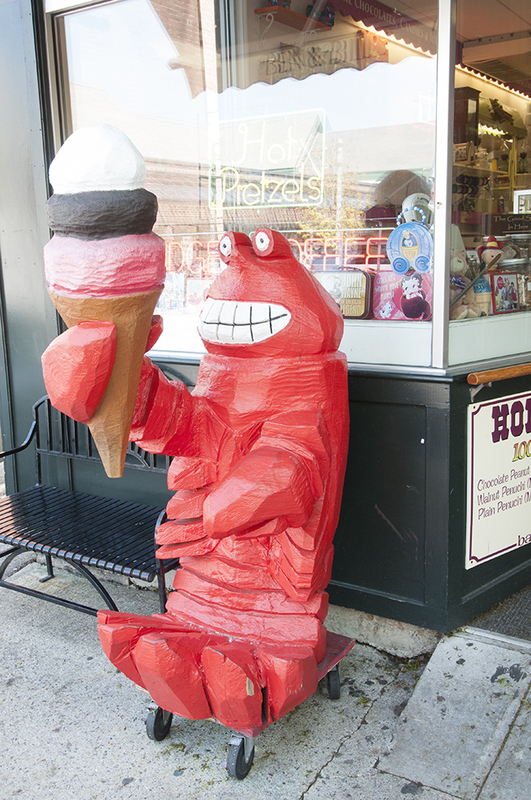 This sums up much of the Maine we saw: Lobster, Lobster Rolls, and Ice Cream. We saw more signs for those three items than anything else! After Bar Harbor Ann poured over the Acadia NP map, but she couldn’t find the visitor center. I took a crack and finally located it; it was called the Hulls Cove Visitor Center. That made us wonder if it was the main Center or just a secondary one. That brings up another unusual feature of the park: it is spread over multiple locations and islands (I counted eleven different areas). Between the different areas are towns, homes, golf courses, etc. June 1: The Cooler Was Leaking? June 1, 2013 • CATEGORIES: Features • TAGS: 2013-May-June-Trip. Last night I discovered there’s very little reception at the campground. So, this brief update will have to suffice until we have more time on Sunday morning during our drive to the Owl’s Head Museum. Yesterday we had a great time with Glenn and the Breakfast Club (pictures and info later). Thanks to everyone who showed up! This morning I put on my gray hoodie. In the pocket I discovered a present left by my wife. It was wrapped in tissue and was the shape of two AA batteries side-by-side. I thought, “Oh, what could it be?” It was pretty light, so I figured it was fragile. I carefully unrolled it from the tissue, but still couldn’t determine what it was. So, I attempted to separate the battery-sized objects. That’s when it dawned on me. It was a pair of tampons. So, it wasn’t a gift for me after all . . .
Minutes later, my wife discovered the cooler had been leaking. The back seat area is damp, so we threw most of our stuff into our tent and will be spending much of the day with all the windows open. Thank goodness the weather is sunny! We’ll be buying a new cooler very soon. We met Jake and his wife who are camping next door to us. They are from Maine. 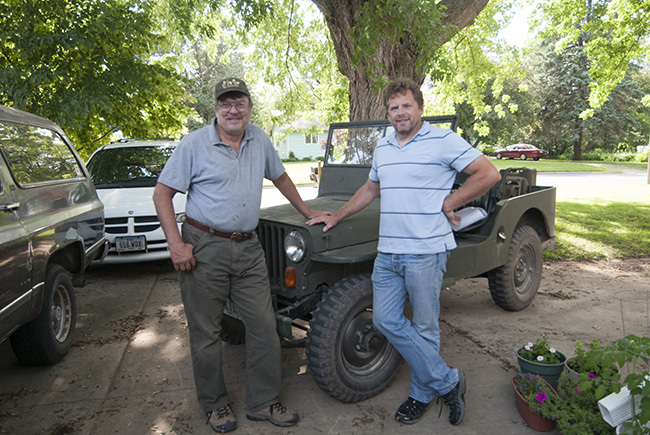 When I explained why Ann and I were in the middle of a two month trip he told me his Uncle had a couple of old Willys jeeps in Montana that they’d refurbished. Seems there are Willys everywhere I go! 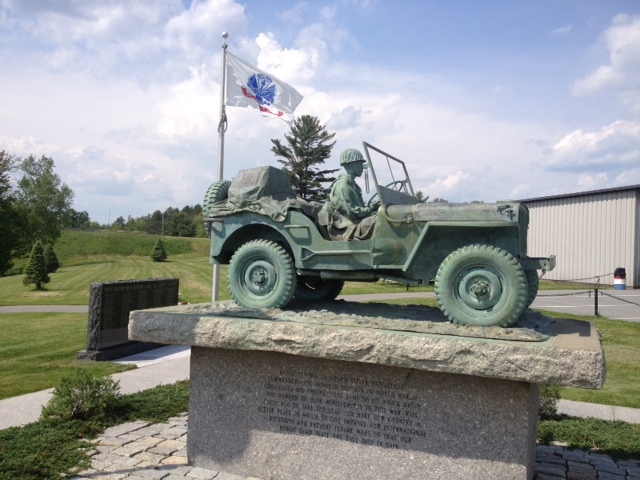 Here’s a picture from the statues at Cole’s Transportation Museum in Bangor Maine. We didn’t have time to stop in there yesterday, but the statue is pretty neat! May 31, 2013 • CATEGORIES: Features • TAGS: 2013-May-June-Trip. More updates later today. We had such a busy thursday that this one took a while. 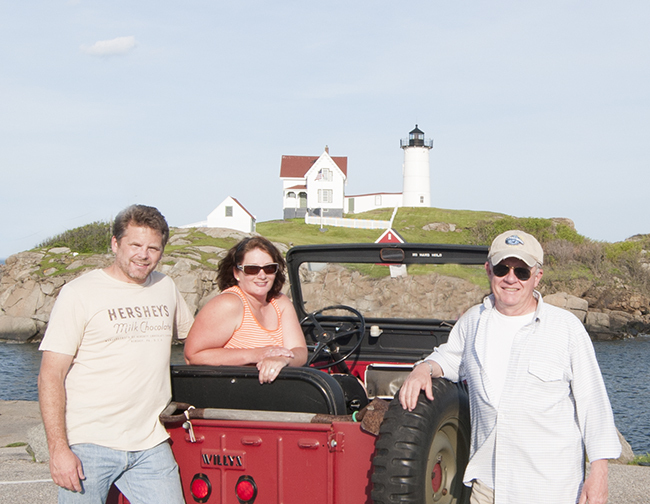 Bob, Ann and I at the Nubble Lighthouse near York, Maine. It seems I was a day ahead of myself with the posts, because yesterday was the 30th (I had the day before marked as the 30th). 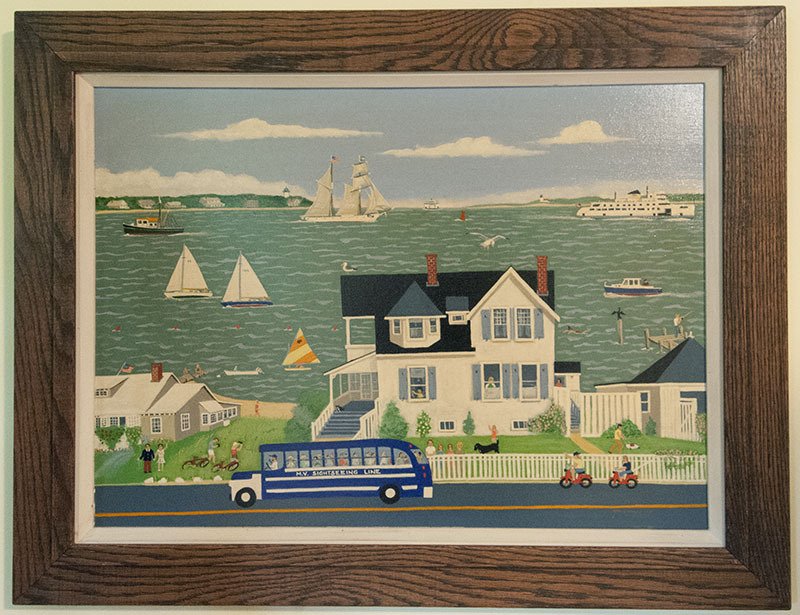 Now that I’ve righted time, let me describe our busy day traveling the coast of New England. 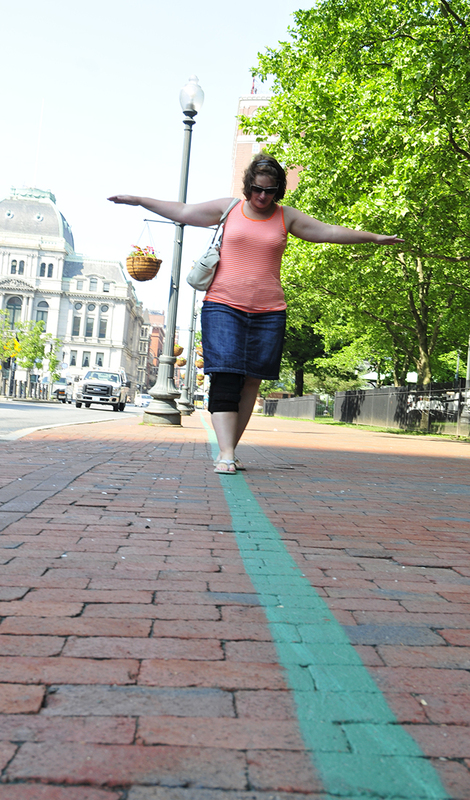 We started in Providence, Rhode Island, walking the Green Mile. Actually, it was more like two and a half miles. 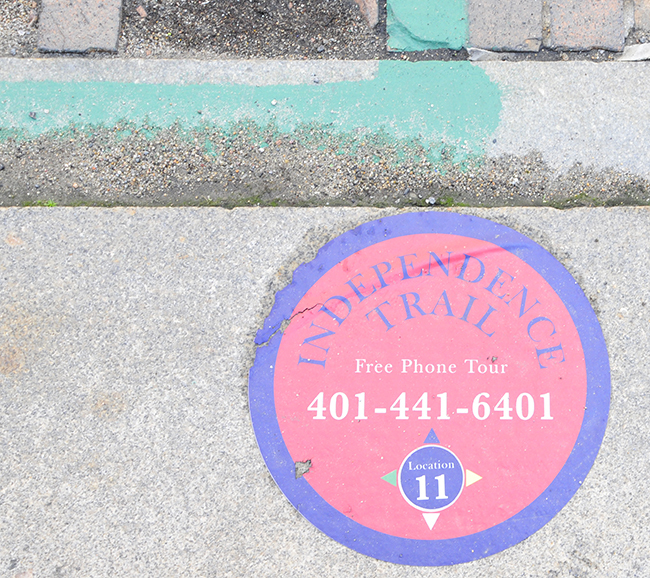 There’s a downtown loop marked by a green line called the Independence Trail that weaves visitors through the cities history as they stroll through the buildings. 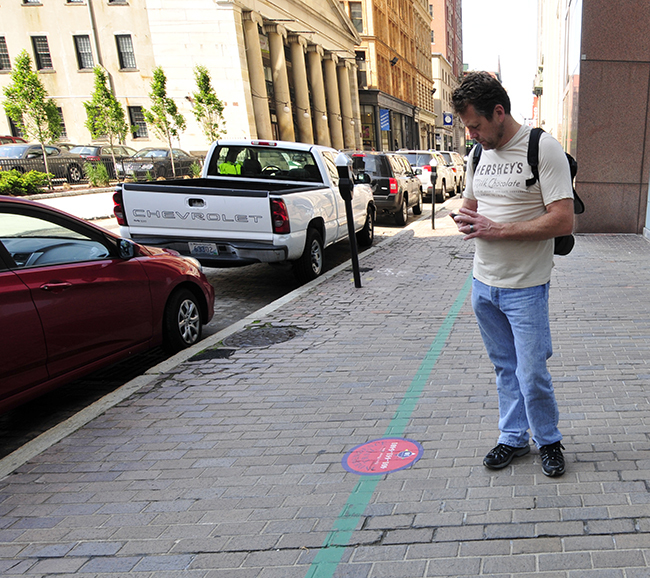 Every so often a painted marker on the ground appears with a phone number and an extension. You dial the phone number, enter the extension, and (theoretically) a voice describes the significance of the location. However, due to some winter storm damage (not sure how the winter weather caused problems with the phone system . . .) the system needed updating. Despite the technological flaws, downtown Providence was fun to explore and the idea of walking the line worked, because we ventured to places we wouldn’t have otherwise. May 30, 2013 • CATEGORIES: Features • TAGS: 2013-May-June-Trip. Over Memorial Day Weekend we’d been staying in Sea Cliff at the Guerci’s house. My relationship with the Guerci’s is another internet-sent miracle. The Guerci’s live in my Great Aunt Emma’s painting studio (which is no small studio) that was built on the former Eilers’ Estate. A few years ago they contacted me and told me they were living there and were looking for a Emma Eilers painting for their house. Mom and I gave one to them for free that needed a little restoration work. Since then, we’ve built a very warm relationship and they have opened their home to Ann and I any time our weary traveling feet climb their stairs. Last weekend they welcomed Karson as well, which gave me a wonderful opportunity to explain some of the family history to him and show him the remaining family homes in the area. I never expected to have that opportunity. 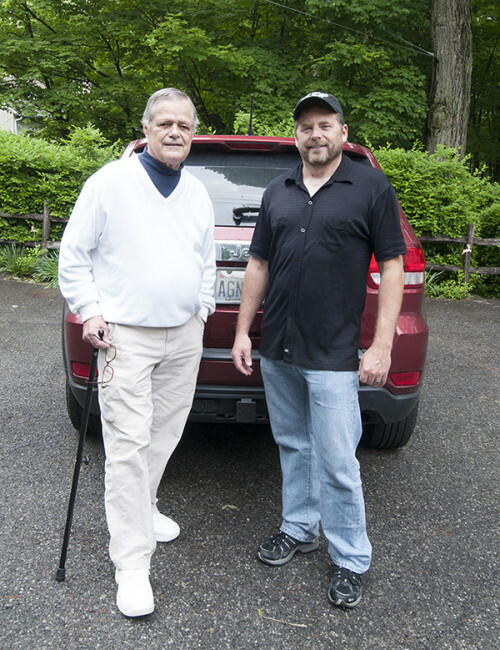 After we said our goodbyes to Sea Cliff, we drove a short distance to Darien, CT, for a dose of family history from a man named George who married one of my father’s cousins. I’d never met him and barely knew of him before we exchanged a few emails prior to our trip out here. I told him we were traveling east and he invited us to stay right away. A former president of a reinsurance company, the eighty-five year old had plenty of interesting family stories from the ‘eastern Eilers’ clan, as well as pictures and information. One of the most fascinating tidbits of information was the reason behind my grandfather’s 1924 trip with his brother through Europe. His mother (my great grandmother) made him take his brother to Europe so that he wouldn’t marry the ‘wrong’ girl. That scheme didn’t work and the man returned from Europe to marry the ‘wrong’ girl anyway and have a happy long life with her. George enjoyed painting for much of his life and said that he couldn’t wait to retire so he could paint all the time. Only, when he retired, he stopped painting. He never seemed to understand why that happened. George told us about a house on Martha’s Vineyard he and his wife purchased (and later sold – it was later torn down and replaced). He painted that house and allowed us to take a picture of it. 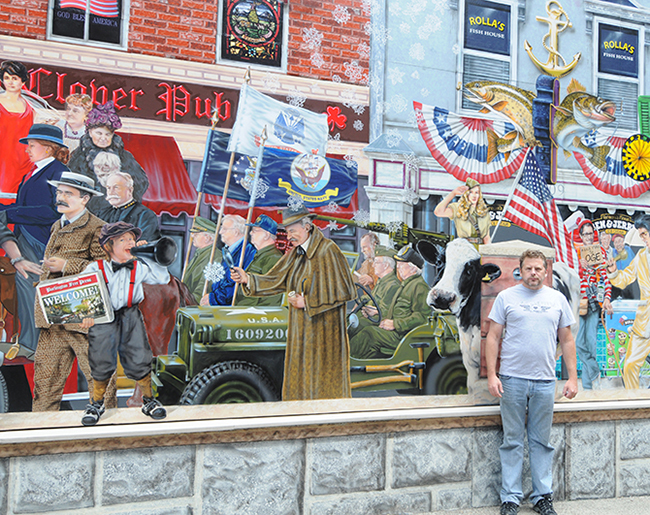 The painting is full of specific references to family members and life at the vineyard. You might recognize the house as the location used as ‘Brody’s house’ for the first Jaws movie. George’s wife Jean passed away a few years ago. In a sweet gesture, he still keeps her recipe holder on the counter that holds a recipe she’d placed there before she died. The funny thing is, he never liked that particular recipe. He liked his marriage to baseball. Some batters walk up to the bases and strike out a few times. If they are lucky, they might hit a home run. With his wife, he walked up to the plate and hit a home run on the first pitch. With a batting average of 1000, he explained he has no desire to step up to the plate again. Very romantic. 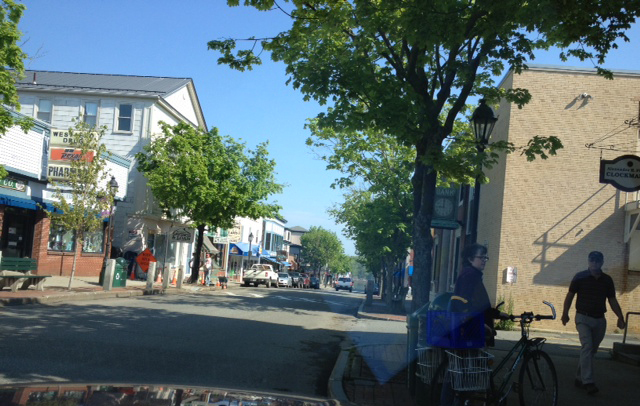 Wednesday morning we left George and traveled through Connecticut until we stumbled on the town of Mystic. 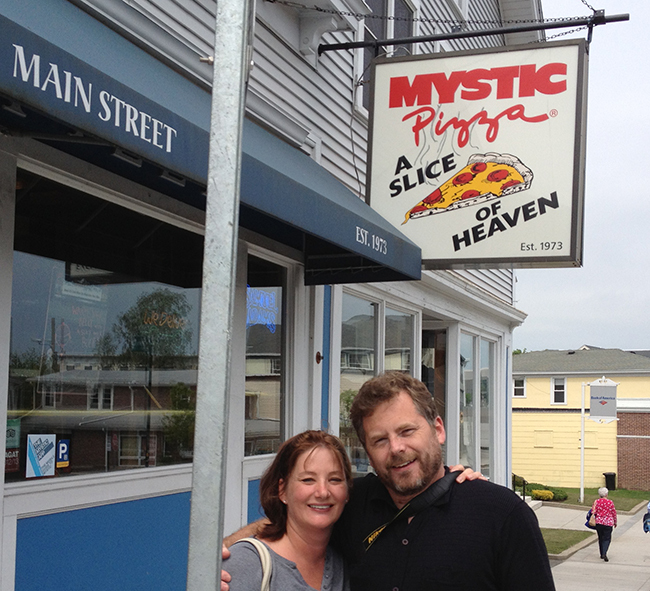 Being the right age during the 1980s, we immediately recognized that it was the town used during the filming of Mystic Pizza, which greatly helped Julia Roberts Career.